We left Charlottesville early Sunday morning it was a crisp clear fall morning; we are westward bound. Our plan is to move quickly to Colorado and then to spend three weeks or so exploring Colorado before we go to Scottsdale. Our first day we drove to Barboursville, West Virginia where we spent the night on the road in a Walmart parking lot. On the way, we needed to stop for lunch and there wasn’t any place, so we ended up in a church parking lot just off of I 64 in WVA. We have a directory that we take with us that lists Wal-Mart’s and their locations. We look for Walmart’s that are just off of the interstate the parking lots are patrolled, well lighted, and safe. Wal-Mart’s allow RV’ers to spend the night in their parking lots because RV’ers usually go in and shop; we do. Although Wally World is not a resort, it is easy on/off the interstates, and they are convenient places to shop for food, RV supplies, medicine, water, ice and a night’s sleep. 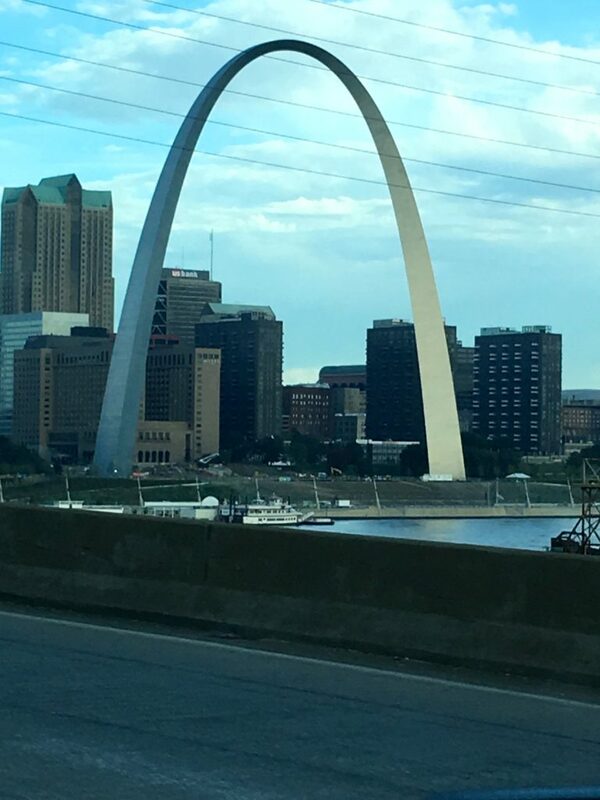 When we are traveling from one place in route to another staying at a Walmart near the interstate is easy and efficient and since we have our home with us it works. Sunday night was clear and chilly, good sleeping weather, and we were up early Monday morning and back on the road by 7:45. We had a long driving day, leaving Barboursville, WV; we drove 399 miles and stopped in Mt. 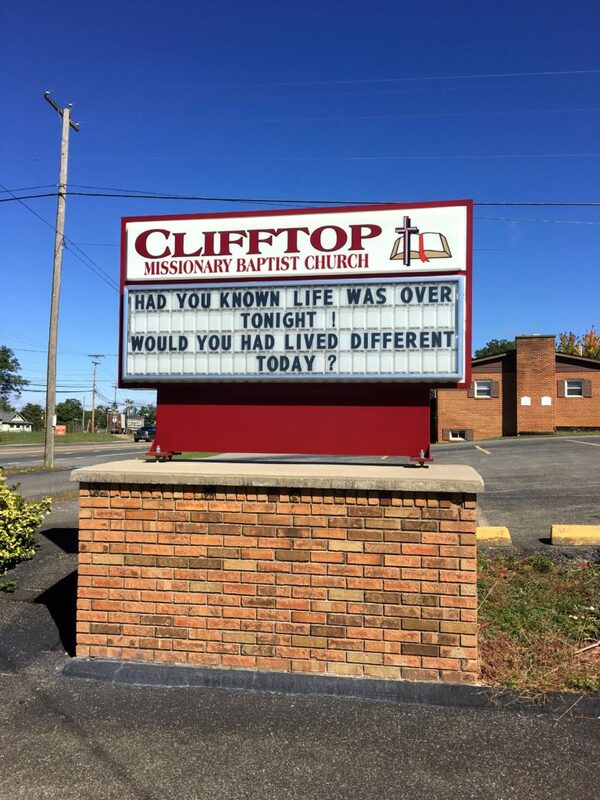 Vernon, IL. We could not find a Wal-Mart near the interstate so we stayed at Archway RV Park. The park was clean and right next to Rt. 64 so we were able to get back on the road early again (6:45) Tuesday. Driving Cee More is tiring even though we switch off drivers about every two hours, we were tired at the end of the day. An ideal distance to drive pulling the trailer is 250 to 300 miles a day. After leaving Mt. Vernon, we had another long driving day of 460 miles. We were tired and found a Wal-Mart on the Interstate in Junction City, Kansas. We checked our supplies, ate dinner, and collapsed into bed. We have been RV’ing since 1997 and we have seen a lot of changes. One huge change is the GPS it makes travel and travel planning much easier. Another change is the huge proliferation of phone apps. Wow, what a difference apps like Google Maps, Waze, Allstays, Gas Buddy, Next Exit to name just a few make for RV travel. Gone by the wayside (almost) is the CB radio. We still have one but rarely use it and neither do the truckers. Also gone bu the wayside are “dial-up modems” that’s what was used in 2000. These new technologies make life on the road much easier! 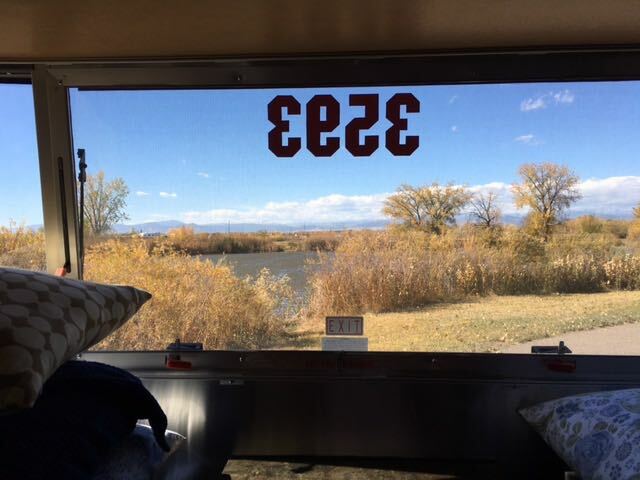 In the past fifteen years, we have noticed the large increase in the number of full time RV’ers. We meet full timers in virtually every campground. Many are older people like us (baby boomers) they no longer own permanent homes. Often they will spend part of the year near a grown child and grandchildren and move to warmer climates as winter approaches. When we first began RV’ing in the late 90’s we were surprised by how many full timers there were then but that number has increased tremendously! Driving through Kansas is like driving through Texas, miles and miles, and miles of flat farmland with almost no place to stop. It is challenging to find places to stop for fuel, stretch our legs, switch drivers, and take bathroom breaks. One of the things that help us log high mileage days is to change time zones. We drove all the way through Kansas (446 miles) because we changed time zones. Originally we planned to stop in Limmon CO but when we got to Limmon, CO it was one hour earlier than the time on our watch face. The fact that it is earlier makes us feel like it’s too early to stop and that we can drive a little farther, so we did. We stopped in Strasburg, CO just west of Denver staying at a KOA campground just off of the interstate. The campground had nice showers and we slept in later than usual knowing that we were in Colorado. 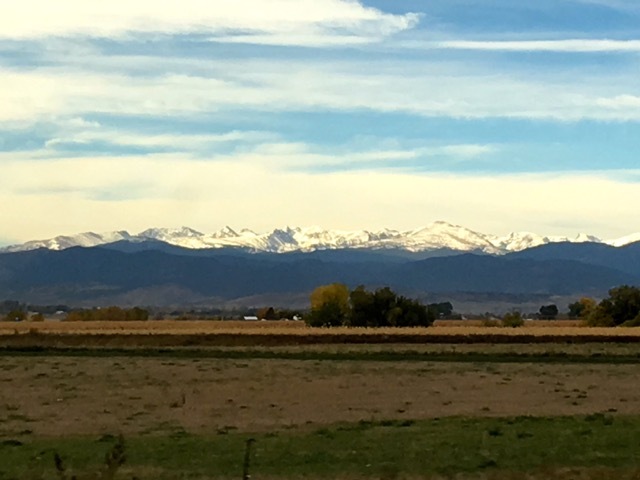 The front range is beautiful, we’re looking west over open flat plains to the high snow covered Rocky Mountains. What a stark change to see mountains and civilization after driving through Kansas. 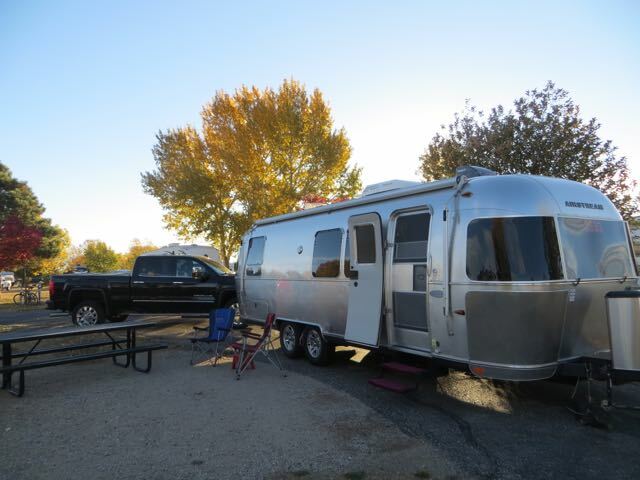 Thursday morning we left the Strasburg KOA and had an easy driving day of 312 miles, arriving at Boyd Lake State Park in Loveland, CO. We plan on spending some time here and visiting Boulder. 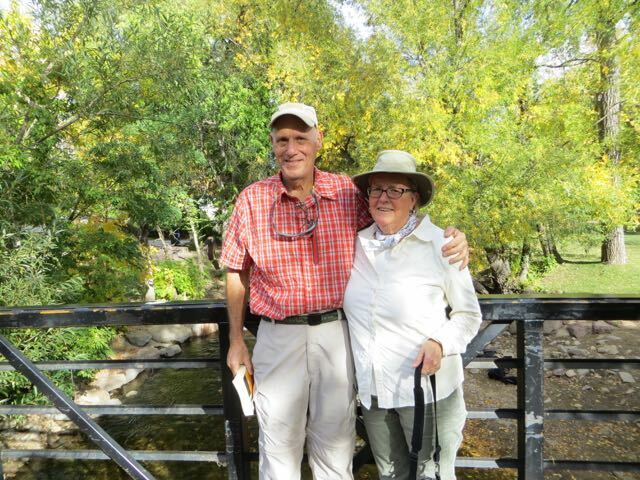 After 48 years of marriage and driving across the country as fast as possible Loveland was a fit name for our first resting place. 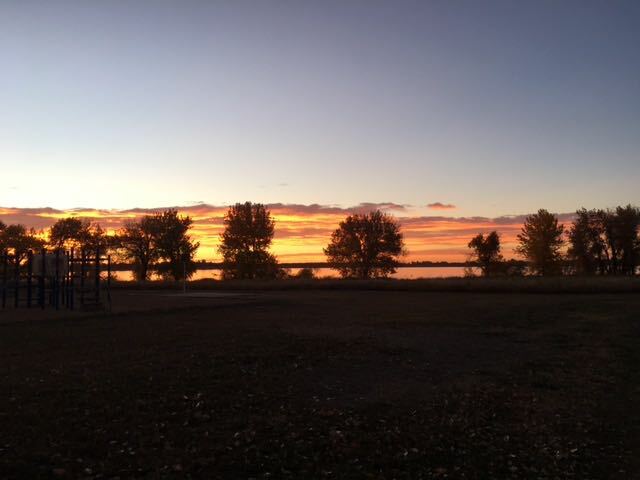 Boyd Lake State Park is a beautiful campground with nice large sites. 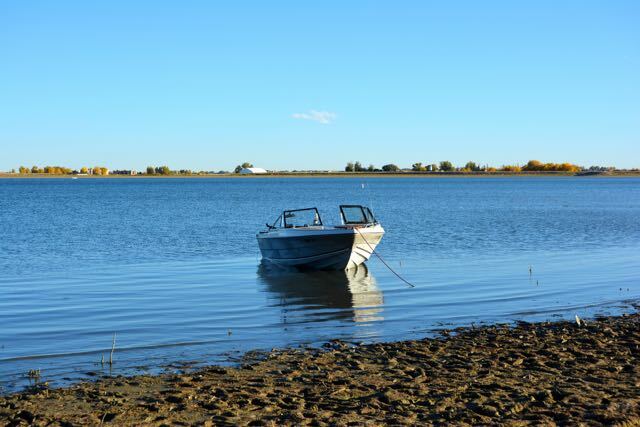 It is a beautiful setting on a huge lake with a vista of the snow capped Rockies. 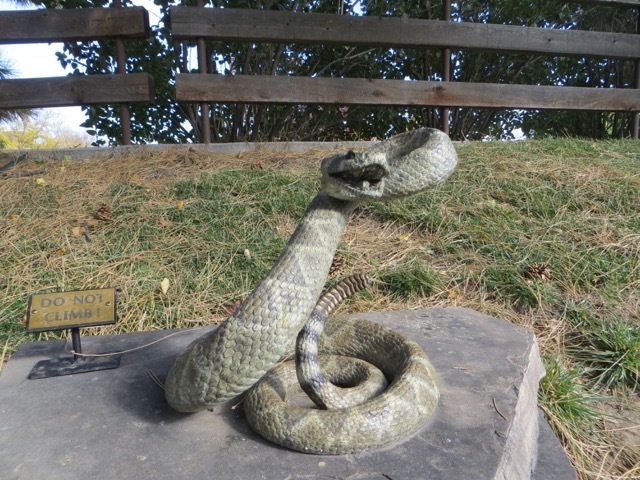 We were told that the Colorado state parks were nice and if this one is representative they certainly are. 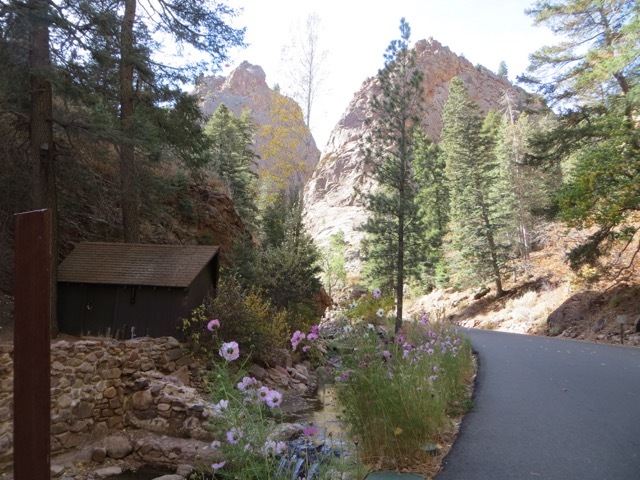 Besides nice sites and a beautiful setting there are walking paths for miles that we took advantage of to exercise. 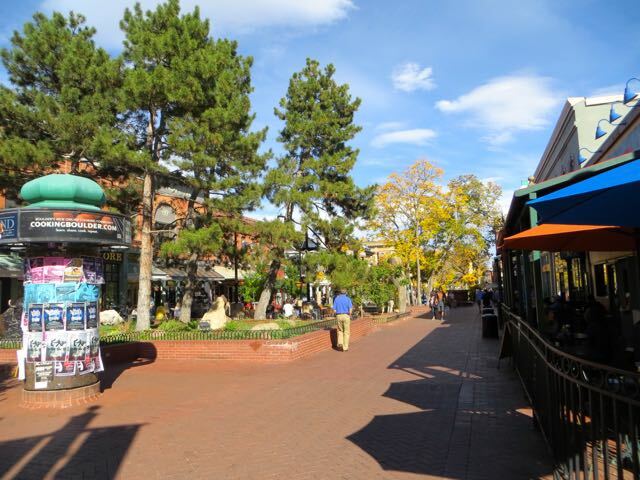 BLSP is pretty close to Boulder, where we want to visit and it is in the town of Loveland so shopping is close by and convenient. We are settled in at BLSP, it is a beautiful and relaxing place. 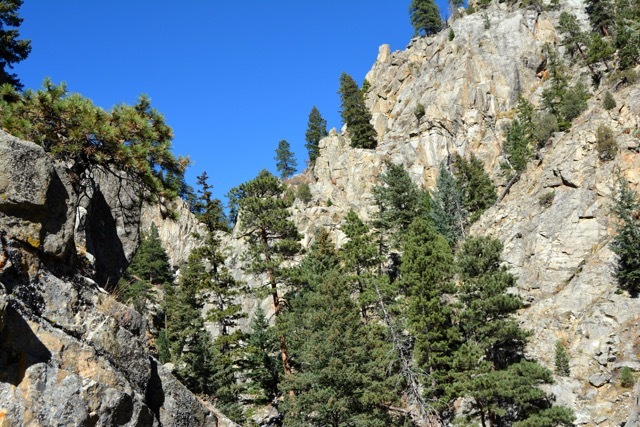 We prefer to stay in State, National, or municipal RV Parks vs. private campgrounds. 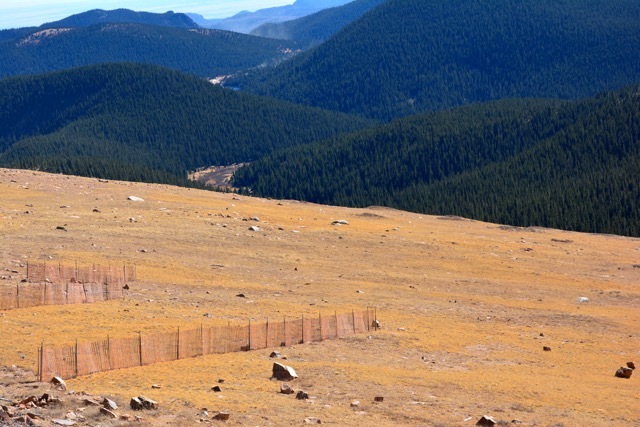 They are nicer than private campgrounds with larger sites. 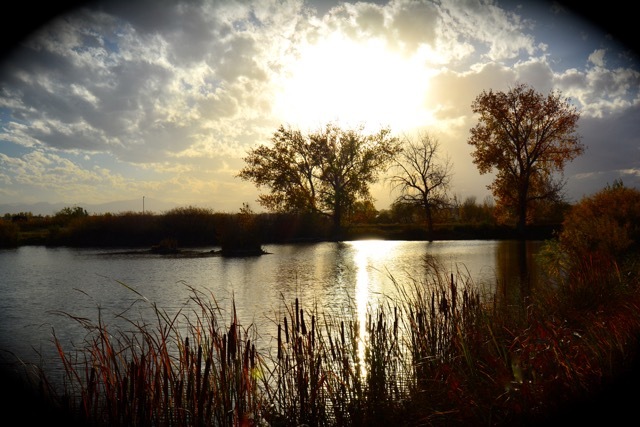 Boyd Lake State Park is clean with large level sites; we only have an electric hookup, that is fine. We don’t need water or sewer hookups because we arrived with our grey and black tanks empty and our fresh water tank full. We travel with several gallons of fresh drinking water because years ago someone told us that it was safer to purchase drinking water in stores than to trust water at campgrounds. We only need electricity because it gets chilly at night and having electricity allows us to use the furnace without running the RV batteries down. 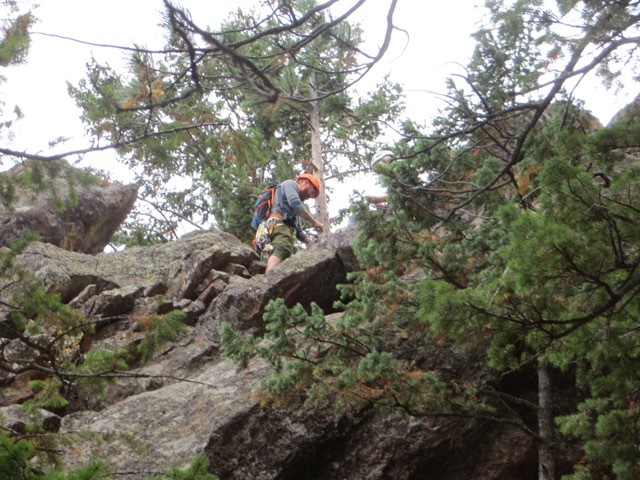 We spent our first day in Boulder, hiking The Flatiron Mountains. You can see from the below picture where they came up with the name Flat Irons. 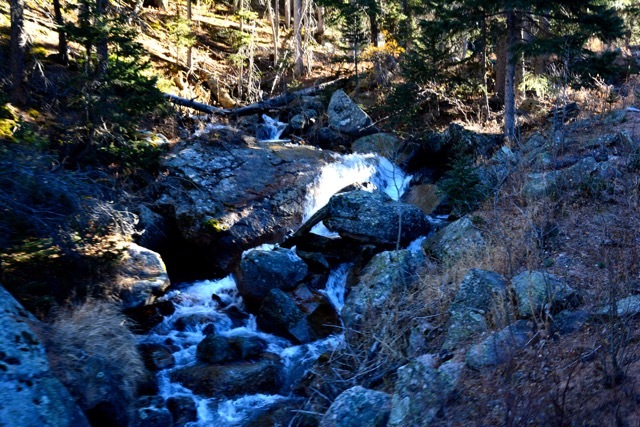 The hike was challenging and the scenery was spectacular. 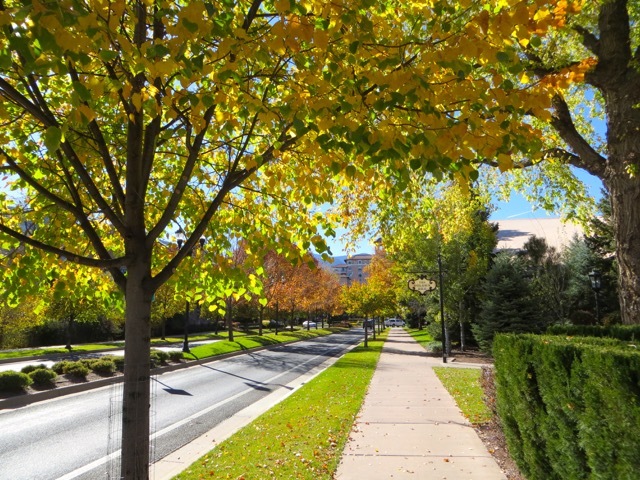 The weather we are experiencing is perfect; sunny, clear, and warm during the day and cold at night. Today set a record; it was the warmest October 15th since 1962. 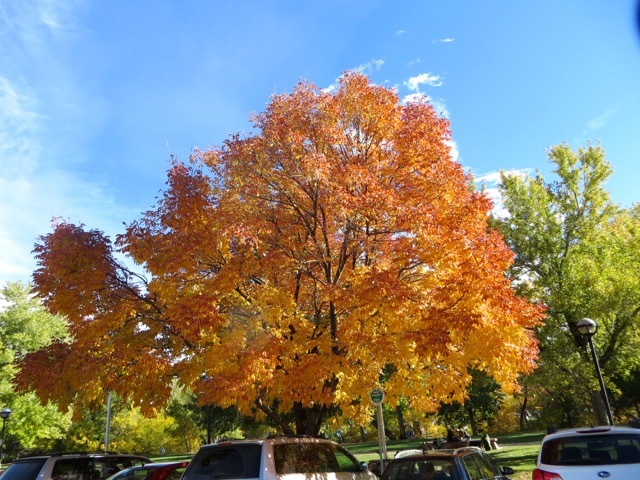 The trailhead for The Flatirons hike starts in Chautauqua Park where the Aspen leaves are golden and shimmer in the breeze. 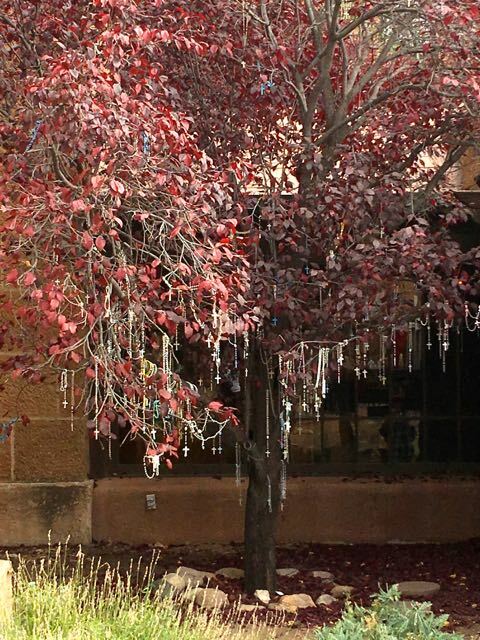 Seeing the Aspen leaves shimmer is beautiful! 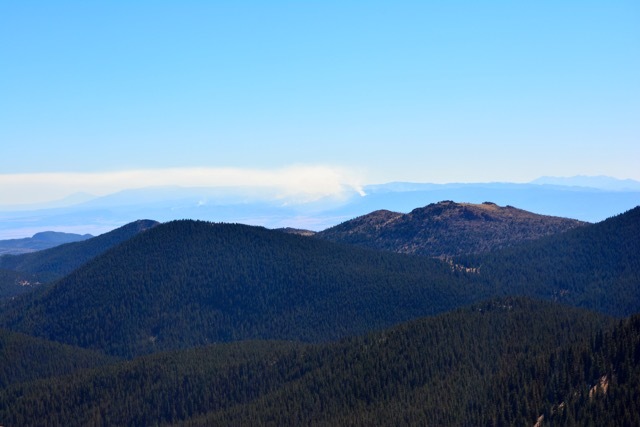 Looking up at the Rocky Mountains you see the snow capped mountaintops. The scenery is spectacular! We took loads of pictures but there is no way to capture this beauty on film! 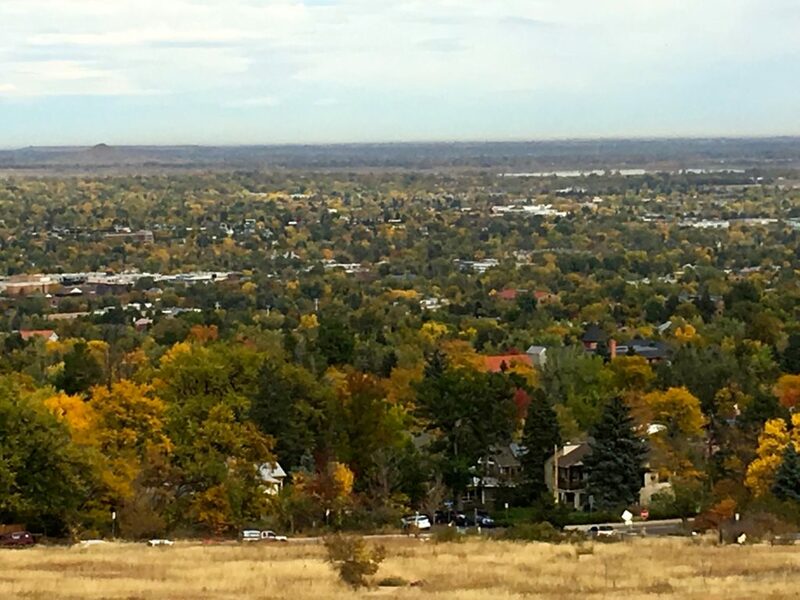 Boulder, like Charlottesville, is a spectacularly beautiful college town and now we understand why so many people want to live here; it is a warm, comfortable town. After our hike we went to a local bookstore on Pearl St; a portion of Pearl St. is a pedestrian Mall. 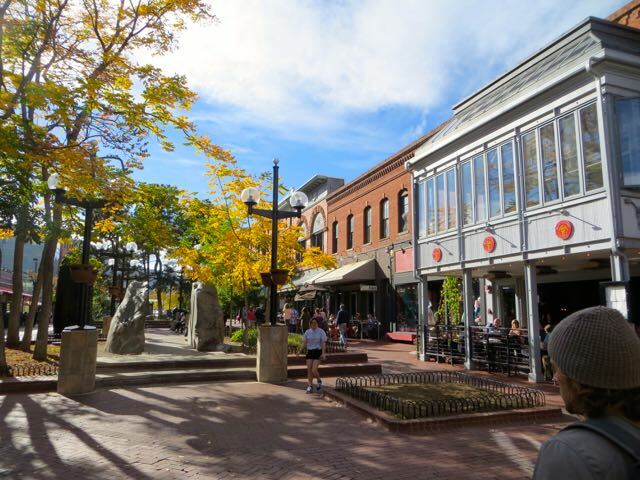 Someone in Charlottesville told us that people from C’ville visited Boulder when they were making the decision on whether to build the downtown Mall in C’ville. 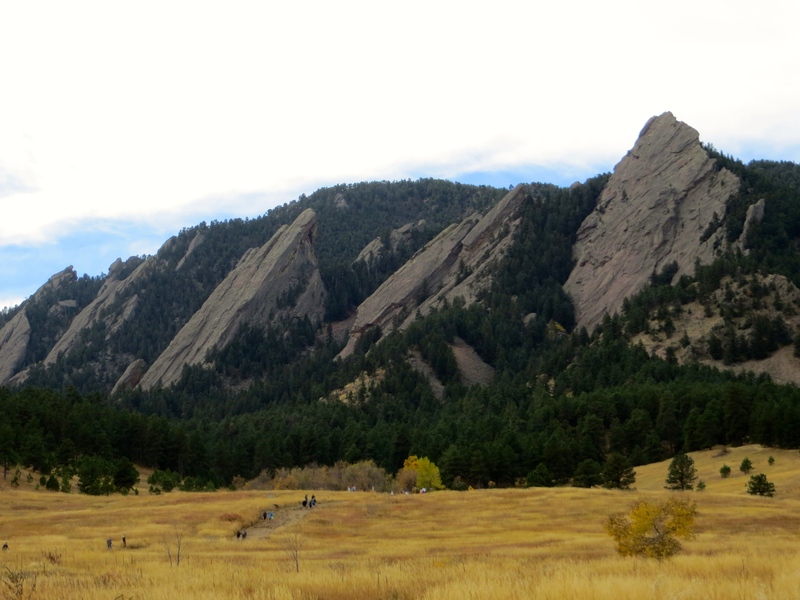 After a full day of hiking, shopping, exploring, and eating in Boulder we arrived back at CEE MORE after five. We ate a prepared dinner that we bought at Whole Foods. Cities with Whole Foods are a benefit; because the prepared food section at WF is convenient especially when you are traveling in an RV! 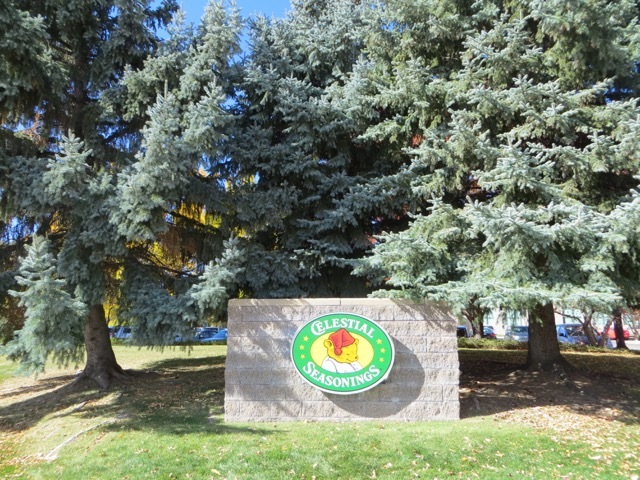 Today began with a tour of the Celestial Seasonings Company in Boulder. 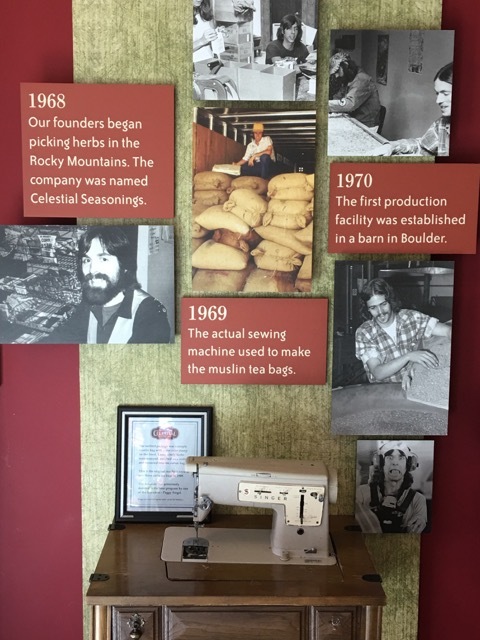 The business was started in 1968; its founder, a hippy type, has grown the enterprise into an international company. We have a cup of Celestial Sleepytime tea after dinner many nights and were surprised to find out that our “tea” has no tea in it at all, only herbs. 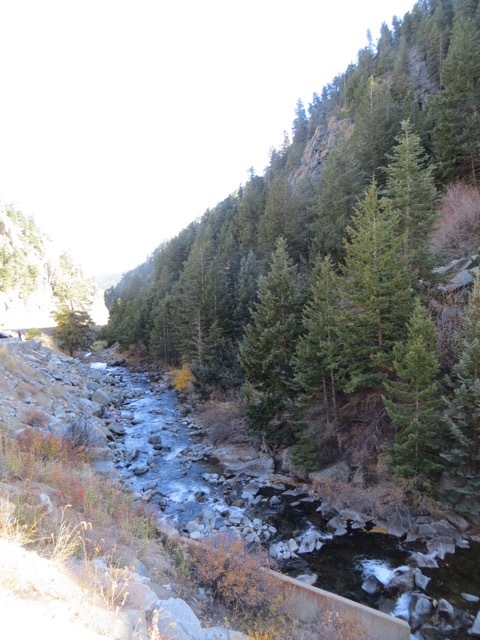 After lunch we drove through a steep canyon to Nederland, CO. Nederland is at a much higher altitude than Boulder; the twenty-five mile drive was spectacularly beautiful with shear canyon walls and a babbling brook beside the road the entire way. It was a beautiful drive; we commented that this would be a good place to “drop out of the world” if someone wanted to hide. It is an extremely remote area and beautiful. The town of Nederland is full of free spirits; selling pot is legal and we guess that it is probably the number one business in town. The day after we were in Nederland we heard on the local news that an old hippie from the 60’s tried to blow up the Nederland police station. They police think that he was trying to settle an old grudge against a former sheriff (now diseased) of Nederland who shot a friend of his in the late sixties. According to the news report, the now diseased sheriff confessed to shooting a hippie in the sixties and was removed from office. The man who left the bomb at the police station was apprehended in Chicago where he now lives. Apparently, according to the news he had lived in Nederland in the sixties and was a friend of the “hippie” that was killed. We spent the day restocking, cleaning the trailer, and doing laundry. 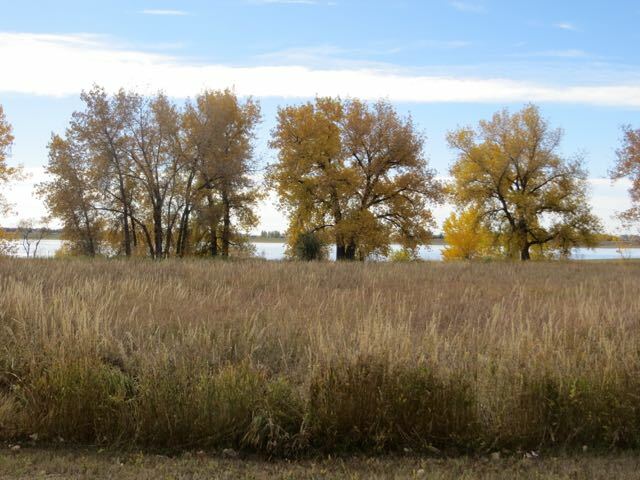 We decided to move to St. Verain State Park in Longmont Co, because it is closer to Boulder. We originally tried to get into St. Varin but it was full. 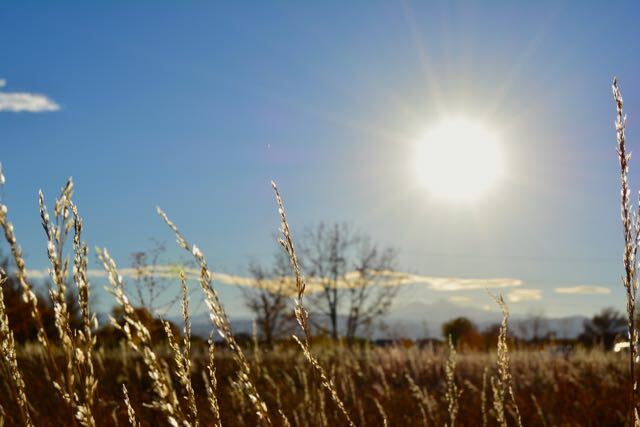 The weather has been picture perfect, temperatures in the mid eighties during day and forties at night but there is a cold front expected tomorrow or Tuesday. 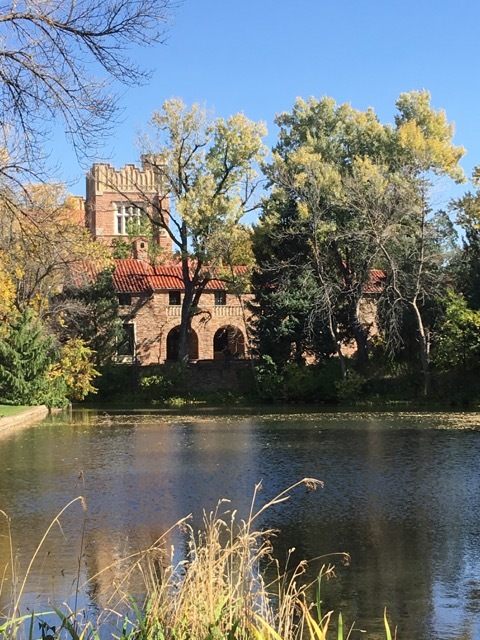 We spent the day in Boulder, walking around the campus of University of Colorado, a beautiful university with most of the buildings built with red limestone. There was a professor that Eddie read an article about and wanted to meet, which he did. Now we understand why people love Boulder Colorado! 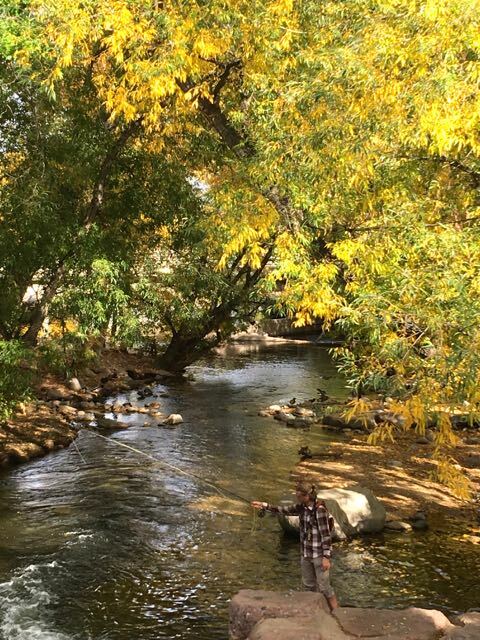 It is a college town with an outdoorsy feel, sophisticated AND granolaee (is that a word) at the same time. 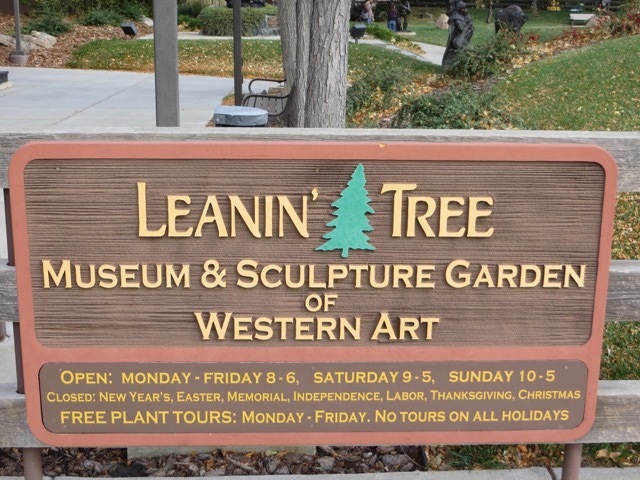 We met our friend Pat Eilts and her daughter Debbie for lunch and then went to Leanin’ Tree Art Museum. Wow is all that we can say. We had wondered whether Leanin’ Tree was worth the visit. 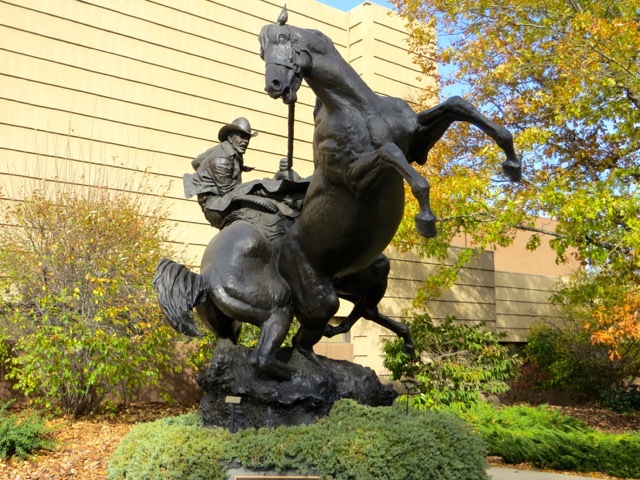 We are glad that we decided to go, the museum is fabulous if you enjoy western art. Just as interesting is the story behind the museum. The museum is free, the paintings and sculptures are all owned by ninety two year old, Mr. Ed Trumble the owner of Leanin’ Tree Cards. He grew up on a ranch in the west and he loves the western way of life. 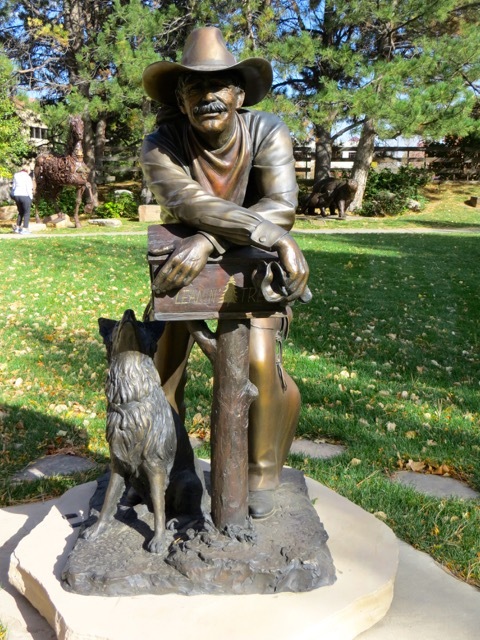 He began collecting western art approximately fifty years ago. Even if you don’t like art museums just looking at the pictures of cowboys and how they live is fun. 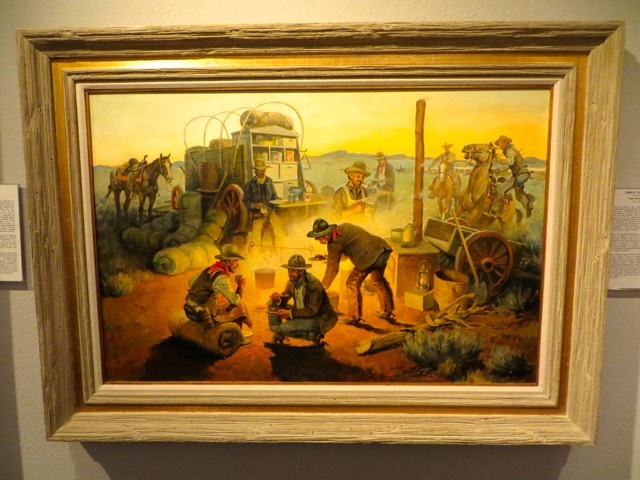 We love western art and this is the best collection that we have ever seen. 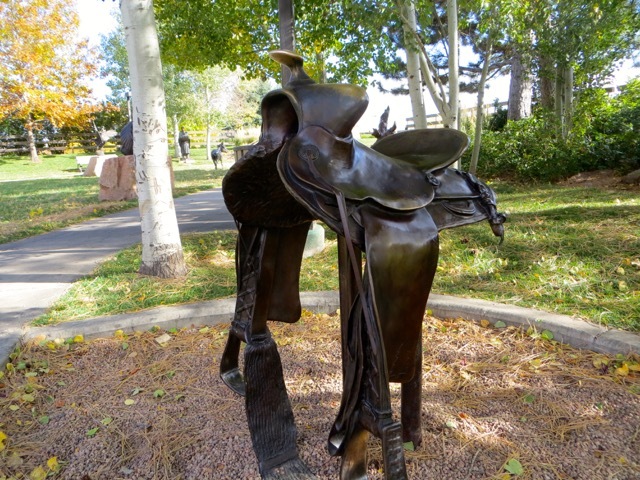 When the Cowboy Artists of America had their show at the Phoenix Art Museum we alway went, this is better! 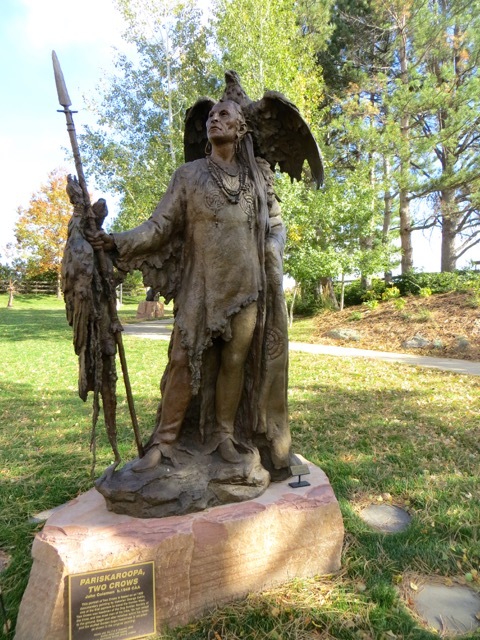 Pictures are allowed outside in the sculpture garden but not inside. They let us take one picture inside the museum “Beans and Beef”. 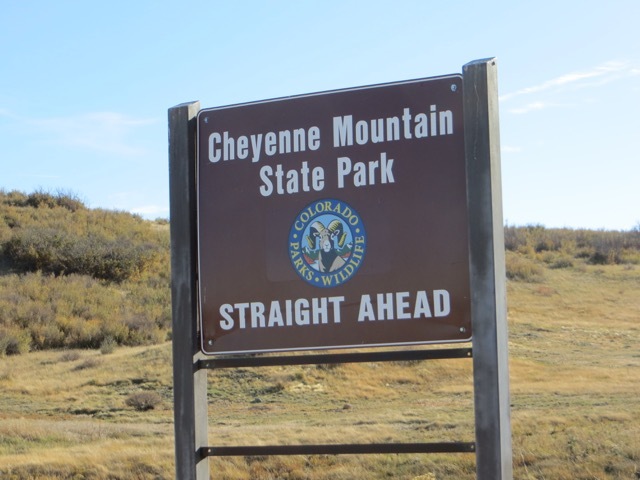 Today we left Vrain State Park in Longmont, Co. headed for Colorado Springs, CO. We arrived in the early afternoon at Cheyenne Mountain State Park it is a fabulous park; one of the nicest parks that we have ever stayed in and we have a fabulous site. 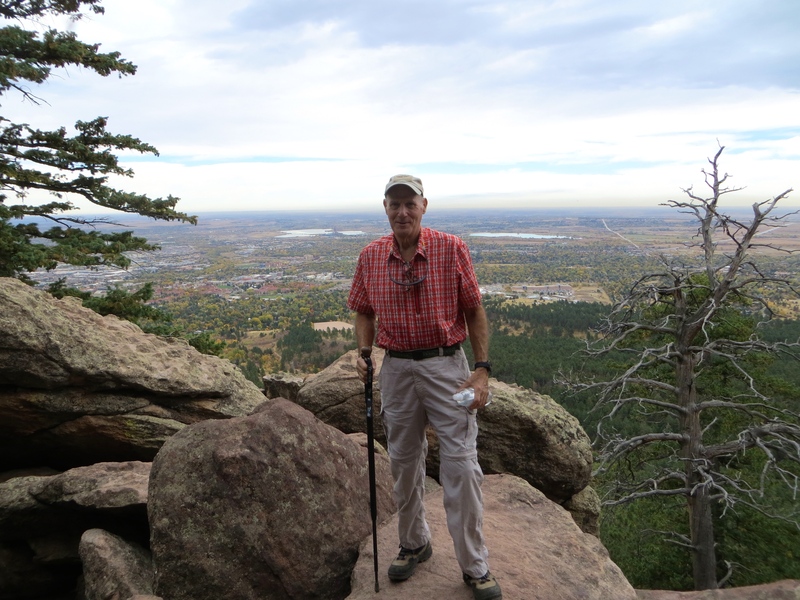 Friends of ours in Charlottesville, Marti and Rick Heck, told us about Cheyenne Mountain. 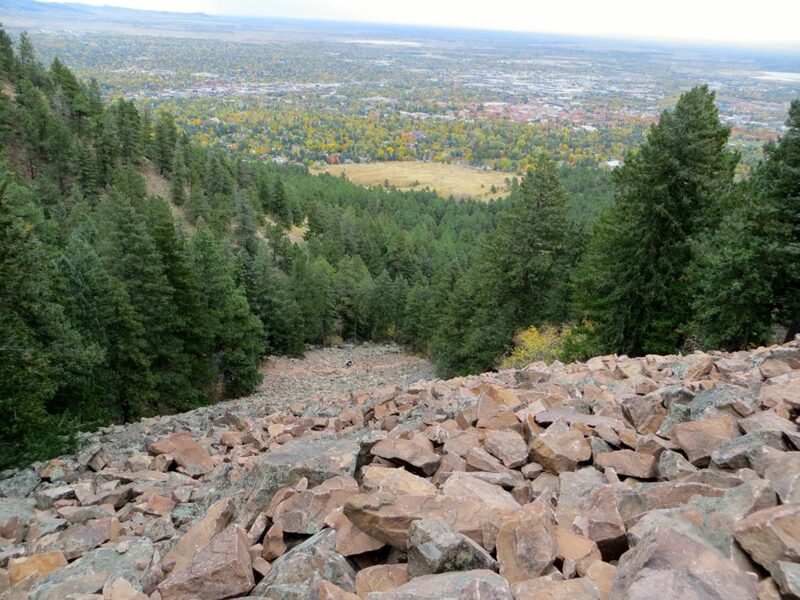 Our site is high with magnificent views of Colorado Springs . 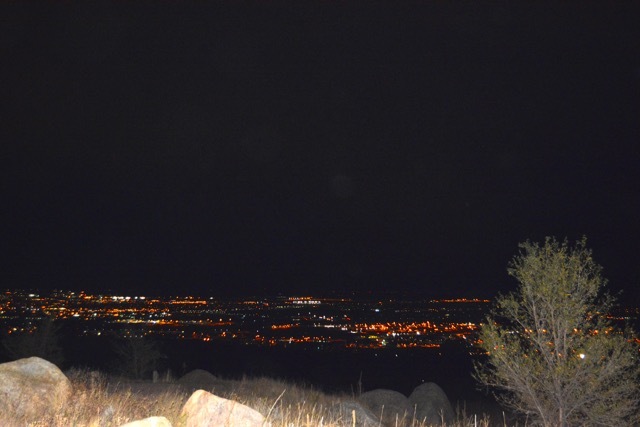 The elevated site is particularly beautiful at night when all the lights come on in the valley below, and we are able to sit beside our campfire and enjoy the view. We can hear them play taps at Fort Carson, the Army facility across the street from the park as we sit by the fire. 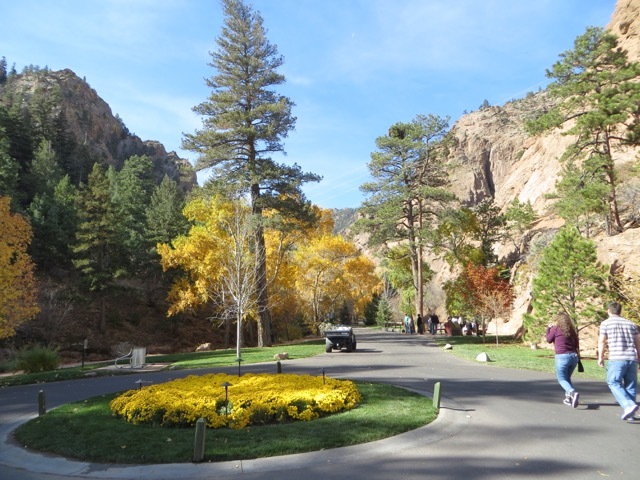 The three Colorado State Parks where we have stayed are all nice but Cheyenne Mountain is our favorite. 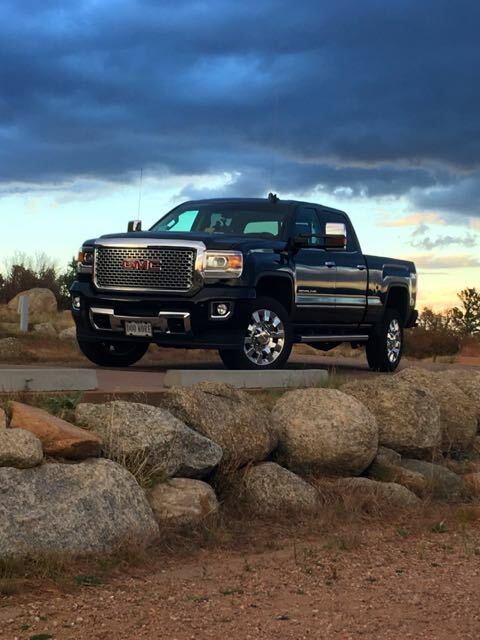 Cheyenne Mountain State Park, Colorado Springs Co.
DOO MORE, the meanest truck in the West! There are so many places to see in the area it is hard to decide what to pick, but our first day was terrific. 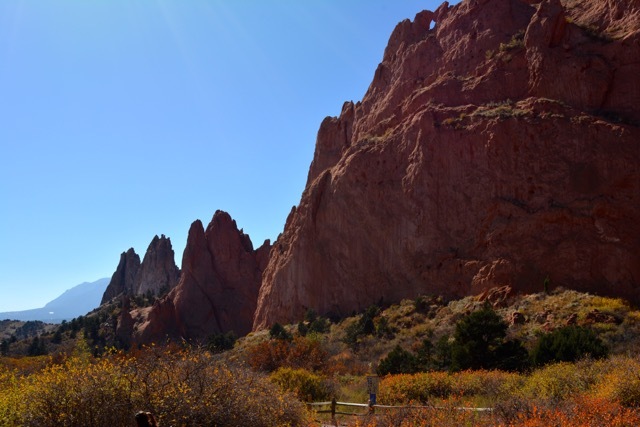 We visited to a place called Garden Of The Gods, which is magnificent. 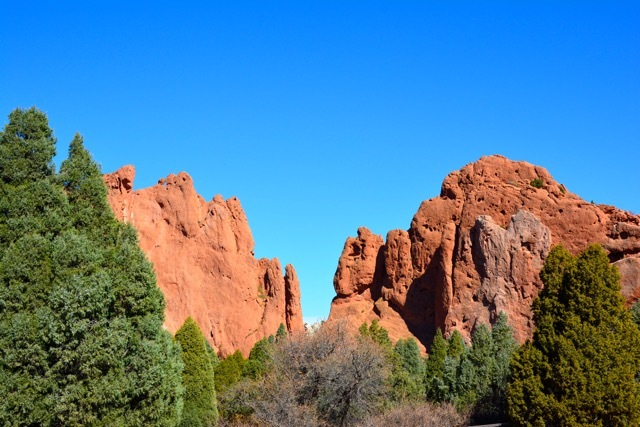 The Garden of the Gods’ red rock formations were created during a geological upheaval along a natural fault line millions of years ago. 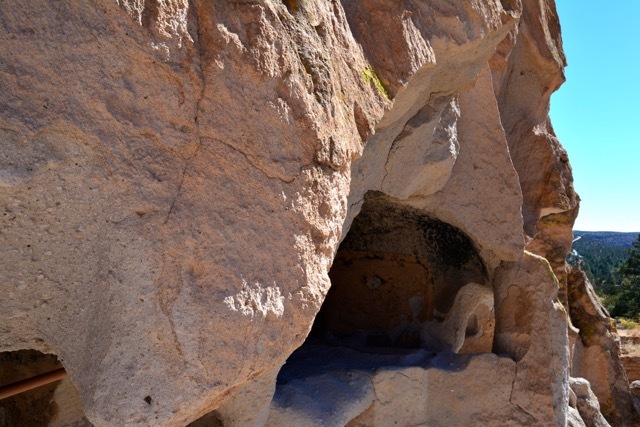 It is now a public park with a well-maintained road that winds thru beautiful red rock formations, with plenty of parking areas to pull over and walk thru the rocks. We took so many pictures it is going to be hard to chose which ones we like the best. 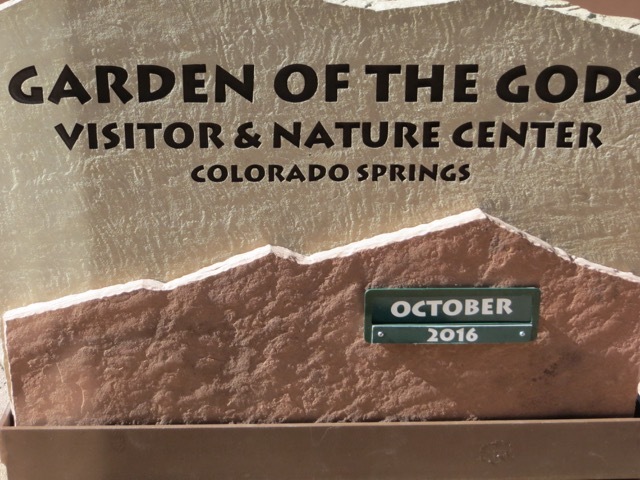 This is the number one place to visit in Colorado Springs, on Trip Advisor and we think it deserves our own designation: VSP (Very Special Place). 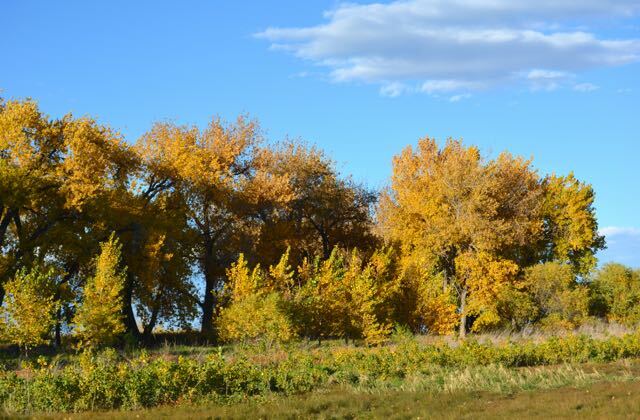 The area continues to amaze us with its beauty. 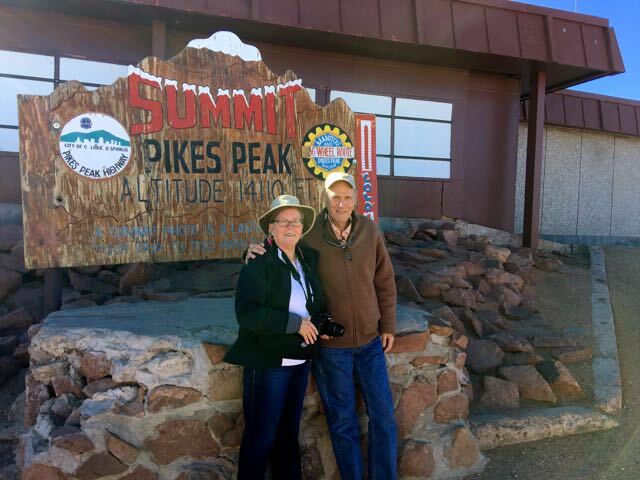 Today we took a train ride up to the top of Pikes Peak on the Cog Railway. You can drive to the top on a very curvy road but we took the train which allowed us time to enjoy the view without worrying about driving off the road. 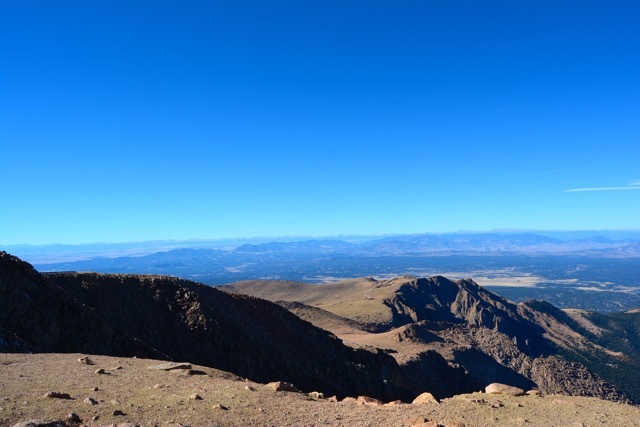 Pikes Peak is the highest summit of the southern Front Range. 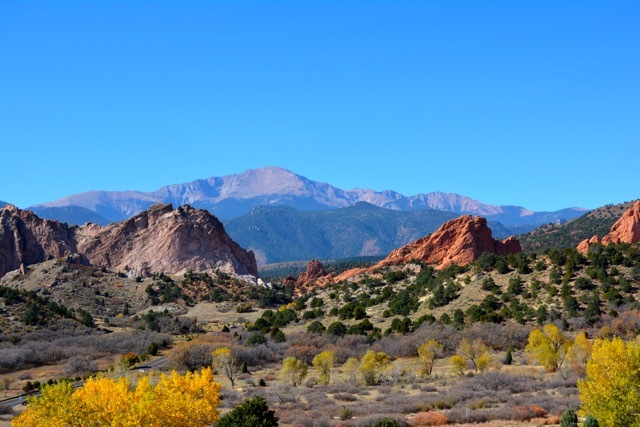 The ultra-prominent 14,115-foot fourteener is in Pike National Forest about 12 miles from Colorado Springs in a “funky” little town called Manitou Springs. 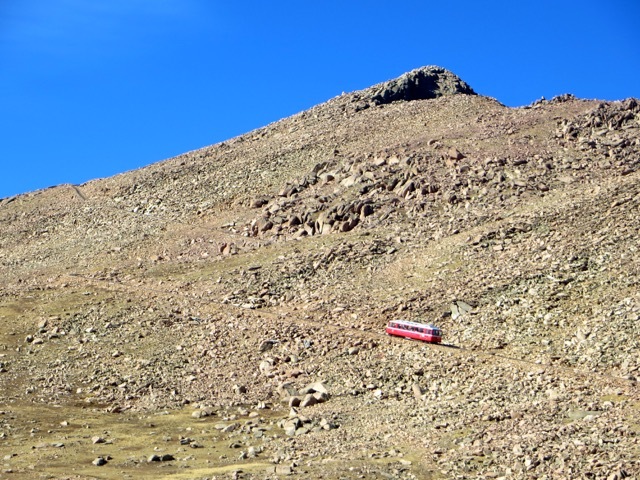 The train was great because we could see for miles and there were great picture opps as we headed to the summit. The train managed 25% slopes with ease, due to its middle “cog” track. The middle track is a cog system with teeth that grab and pull the cars along. At one point the conductor told us that because of the 25% slope, the front of the train was three stories higher than the back of the train. The train only had two or three cars. At the top, we felt as if we were on top of the world. Yep it was another VSP! 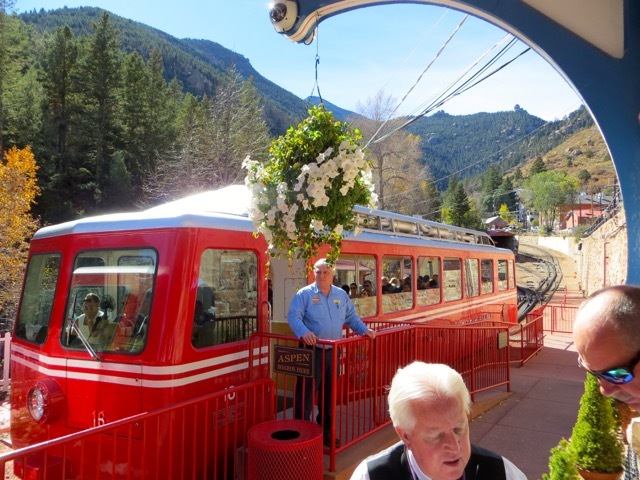 Our train ride up Pikes Peak was Friday, the Sabbath begins at sundown on Friday night. 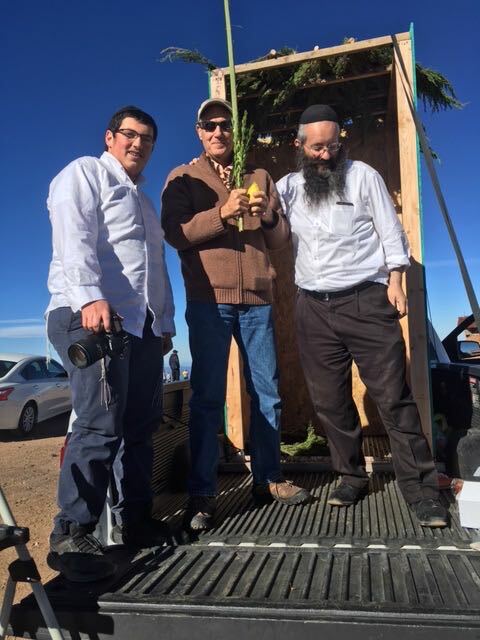 Eddie saw a Chab Rabbi with a Sukkah on the back of a pickup truck at the top so he said “Shabbat Shalom”. The Rabbi said “oh do you know someone Jewish, Eddie answered “I am Jewish”; and with that Eddie was pulled up on the back of the truck and reciting prayers along with the rabbi in Hebrew. My Jewish faith is strong but my Hebrew is weak! 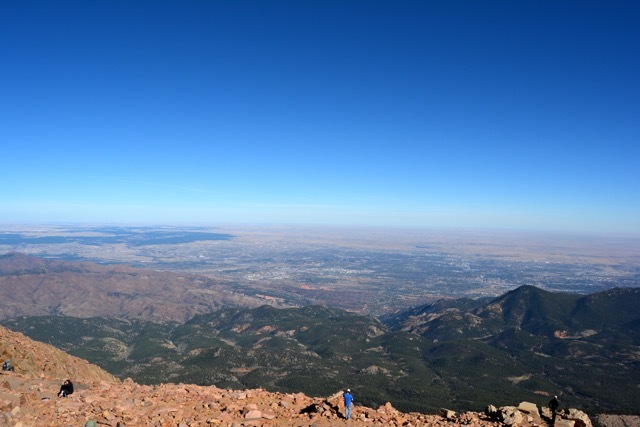 Pikes Peak, Air Is Thin, Faith Is Strong, Hebrew Is Weak! We had two different experiences today. 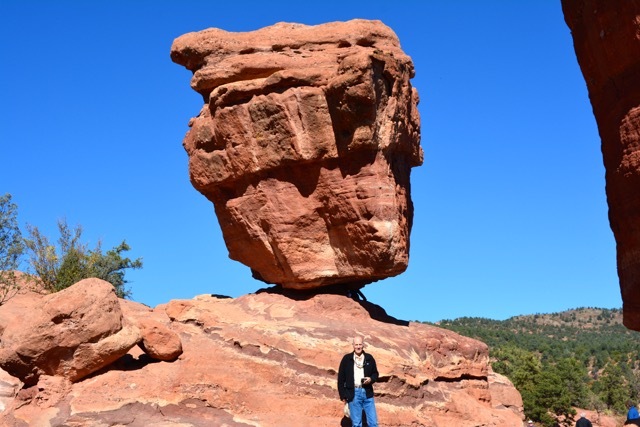 We went back to the little town of Manitou Springs, which is nestled between Pikes Peak and the Garden of the Gods. It is an eclectic town with small shops and restaurants to attract tourist. We met a man who lived there who explained that each town in CO can vote on whether or not to allow the sale of marijuana. 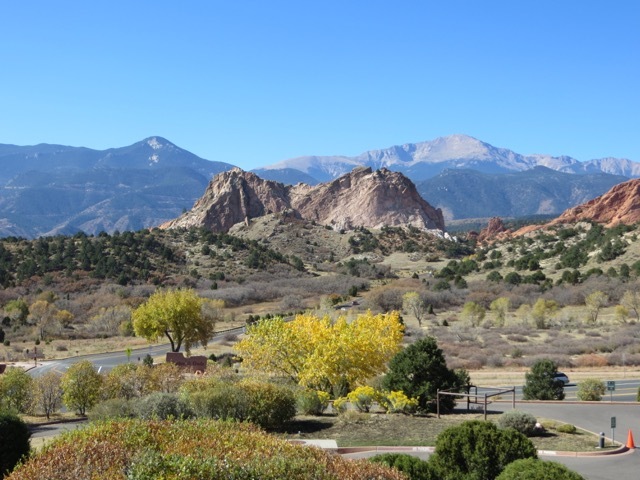 Manitou Springs voted yes while Colorado Springs voted no. 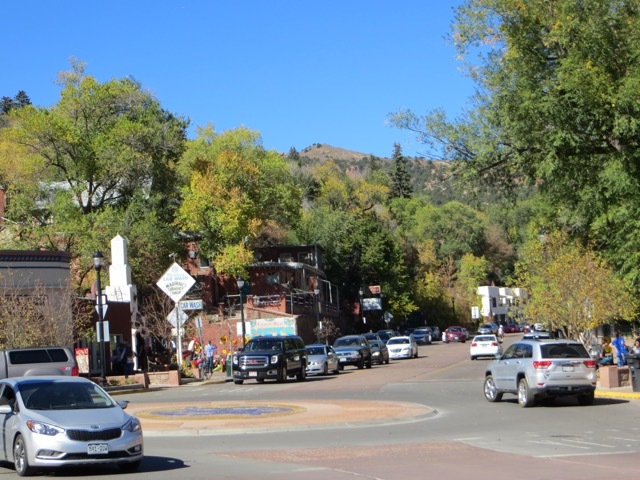 Manitou Springs is fun to walk around we had lunch and then decided to go to the other extreme and visit the famous and magnificent Broadmoor Hotel. 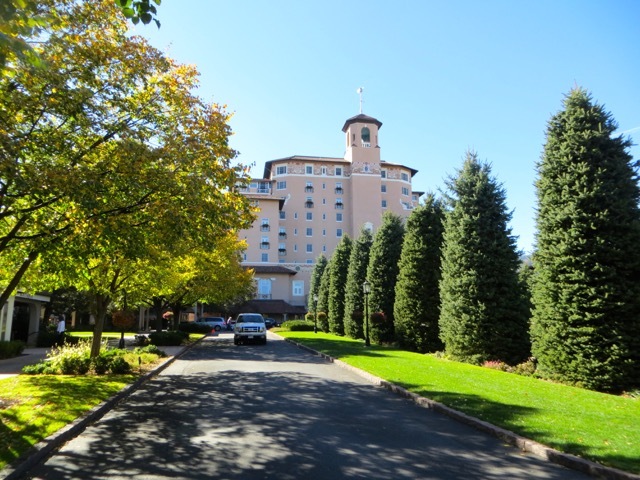 The Broadmoor is a resort in the Old Broadmoor neighborhood of Coloado Springs. 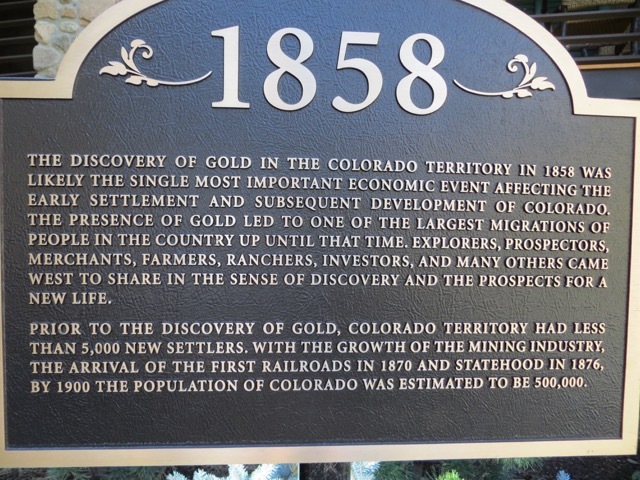 It was built by Spencer Penrose who came from Phildelphia and made a fortune in gold and silver mining. 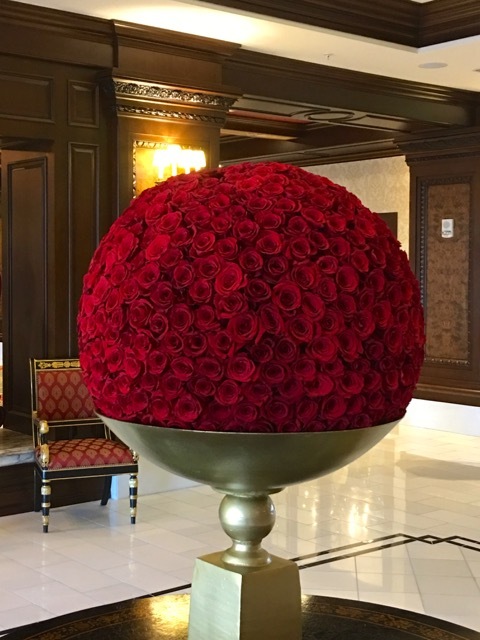 The resort was completed in 1918 and it is the longest running consecutive winner of both the AAA Five Diamond Award and the Forbes Travel Guide Five-Star Award in addition it is a member of Historic Hotels of America. Visitors include heads of state, celebrities, professional sports stars, and businessmen. 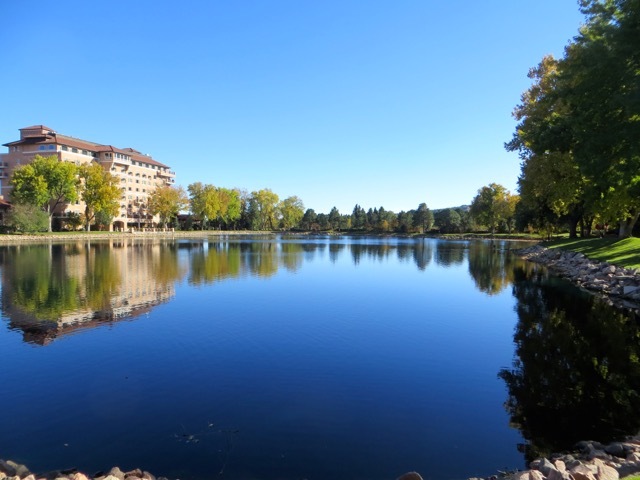 The main resort complex, situated at the base of Cheyenne Mountain is near our campground located on Cheyenne Lake. The architecture and the color is like the grand hotels found on the Mediterranean coast with a pink stucco color that blends in with the area landscape. The art, architecture, furnishings, decor, grounds etc. are elegant and understated. Simple western beauty everywhere you turn and the staff is friendly to everyone! 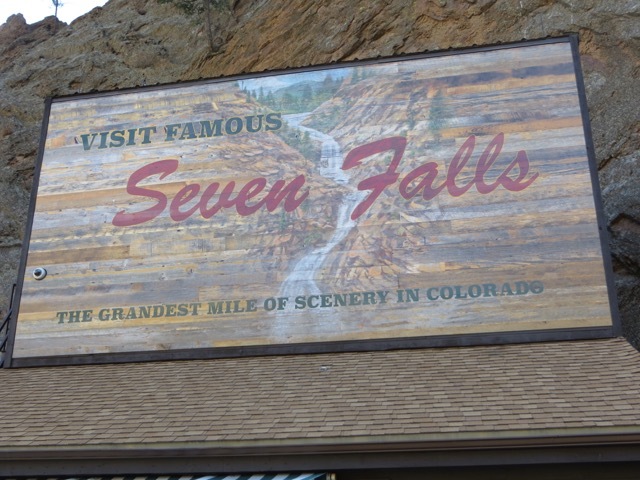 Today we hiked to Seven Falls, it is one of the most spectacular hikes that we have ever taken as far as natural beauty! 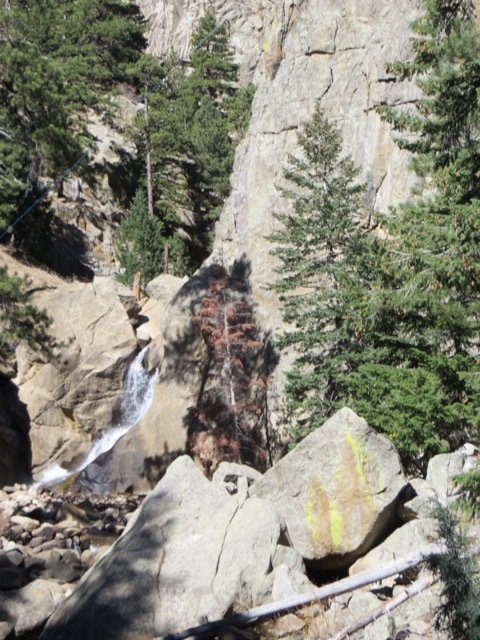 It was not physically challenging; Seven Fall is owned by The Broadmoor Hotel and it is considered one of prettiest miles in Colorado! We agree it is magnificent and today was sunny warm and beautiful so a perfect day to hike. 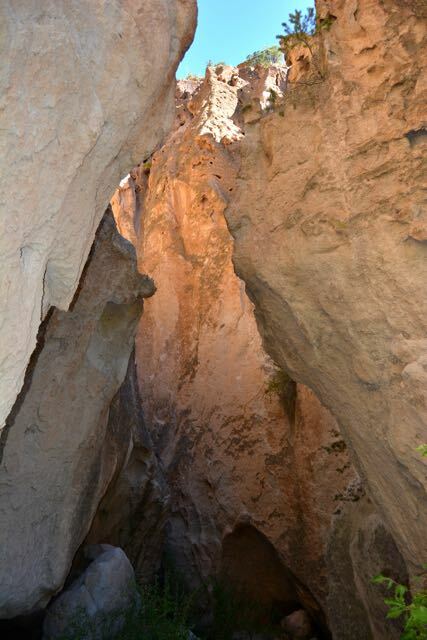 The mile walk takes you up a slot type canyon with a babbling stream the whole way. 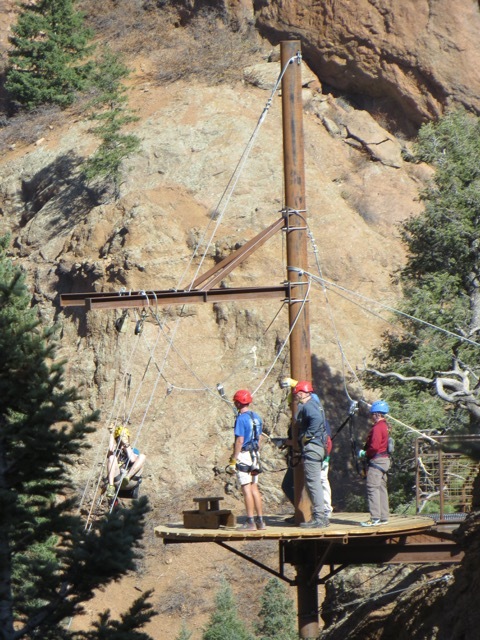 At the top is a four star restaurant along with a zip line that Eddie wanted to do until he discovered the costs – $350. The below pictures don’t tell the whole story, it goes in the book as another VSP. This Picture Doesn’t Do It Justic….Spectacularly Beautiful!!! 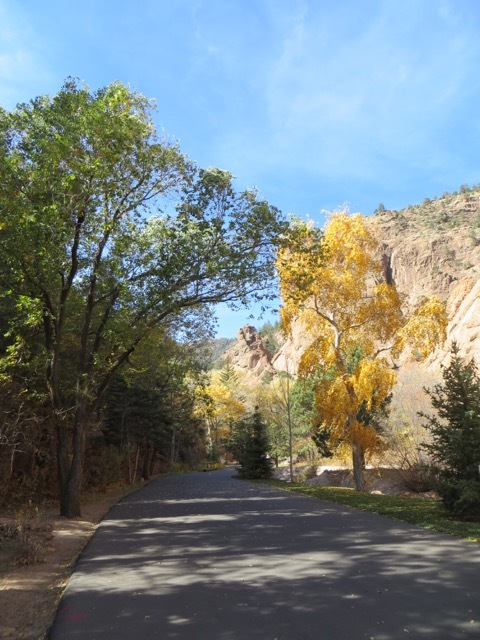 We left Cheyenne Mountain State Park after a wonderful stay at 8:00 AM headed for Santa Fe, NM. We ended the day at Trailer Resort RV Park in Santa Fe. 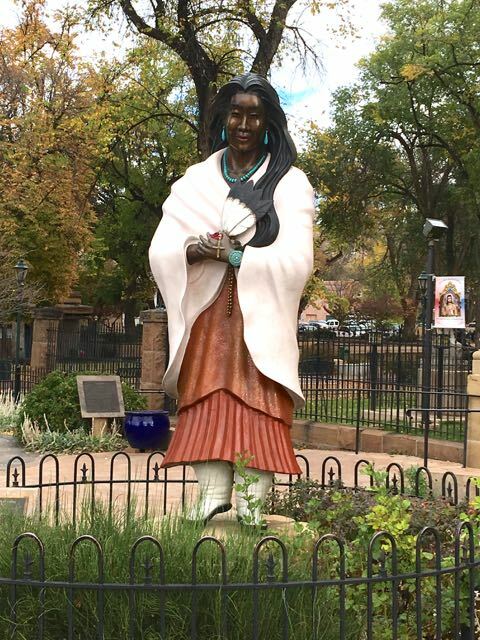 The park was convenient to downtown Santa Fe, with nice staff and clean bathrooms. It’s a nice RV Park but a let down for us since we have been staying in State Parks for the past few weeks. 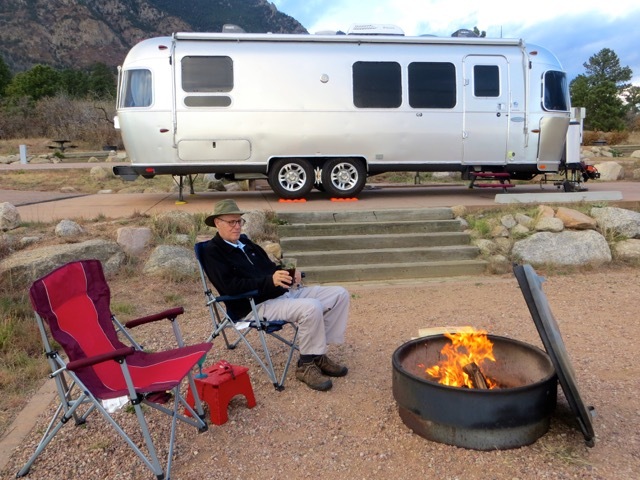 Private RV parks just can’t compete with National or State Campgrounds. 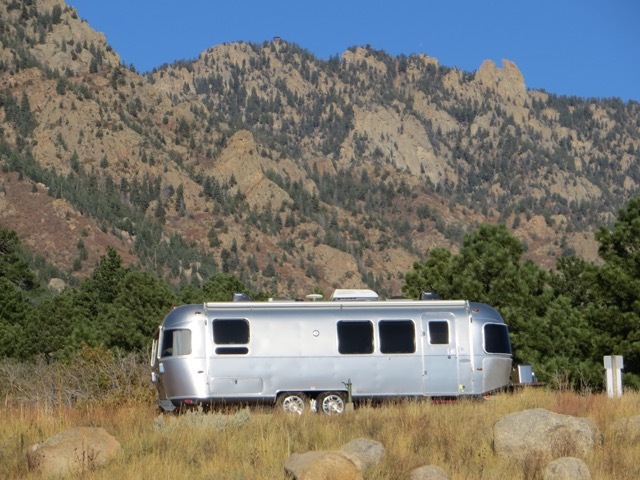 It’s unusual to see Airstreams, you may see one or two in an RV park there are six Airstreams here now. A benefit to where we are staying in Santa Fe, is that there is a shuttle bus that stops at the campground. 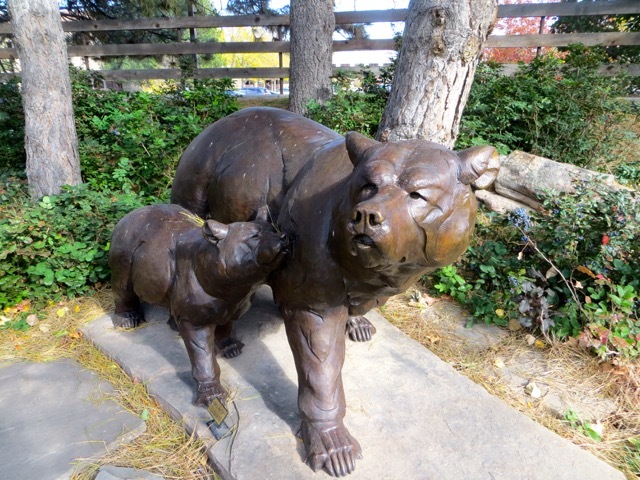 We took the bus downtown, and walked around the Plaza and then along Canyon Road, which is known for its art galleries. It is was fun to meander in and out of shops on this pretty street with interesting architecture. The day like all of the days so far was warm and sunny with crystal blue sky. In one of the shops we talked to a nice lady mentioning we would like a place where vegan food was served. 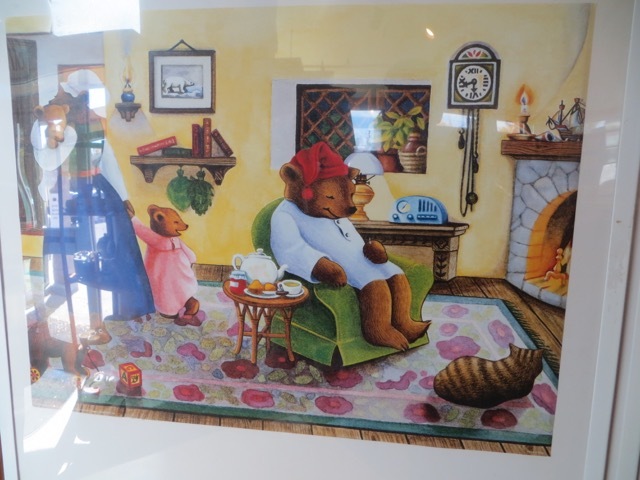 She suggested the Tea House, it was a good find, we had a nice lunch sitting outside on the patio enjoying the warm sun. 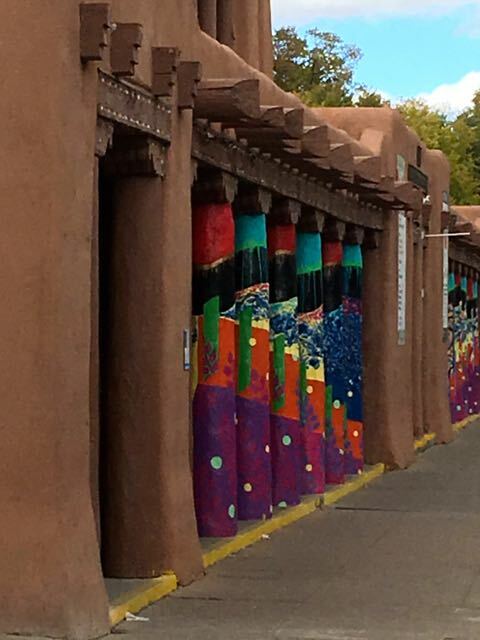 We have been to Santa Fe twice before; for some reason we did not enjoy the downtown area as much this trip. 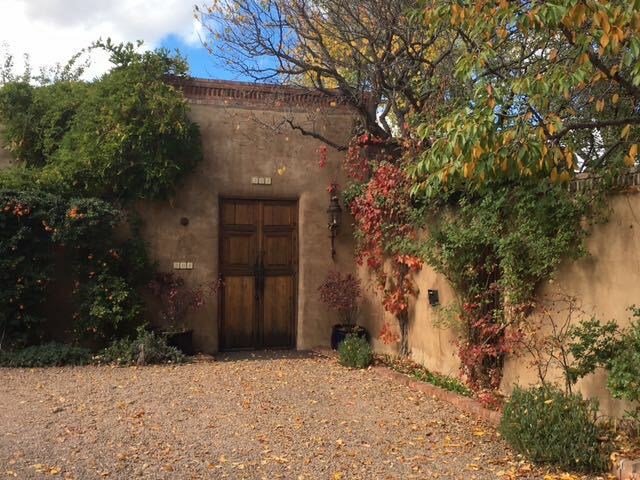 We had a wonderful day exploring two different sites outside of Santa Fe. 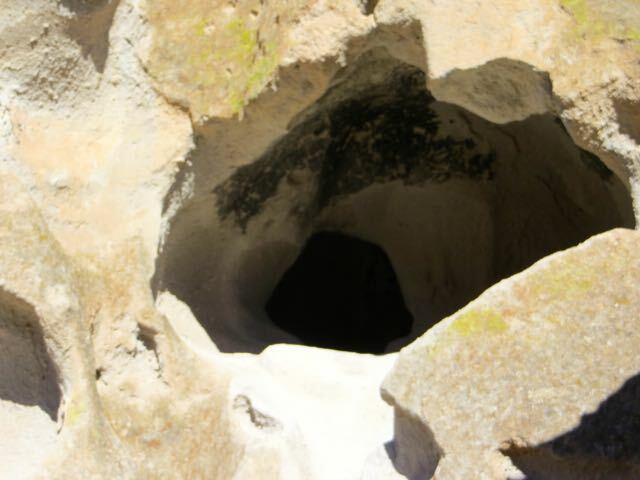 The first was Bandelier National Monument about forty miles north of Santa Fe. 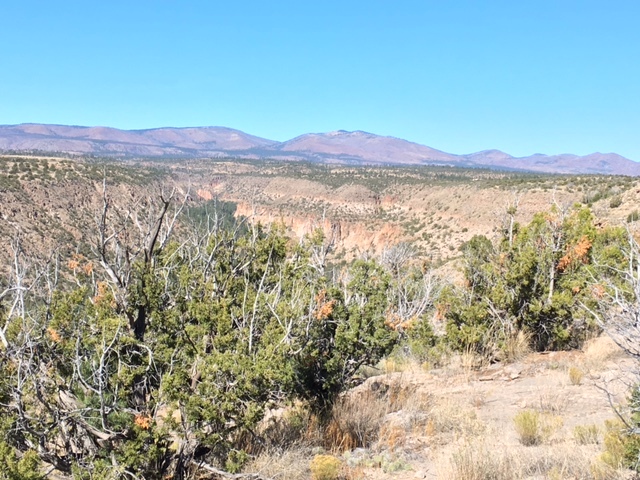 The drive was spectacular, we both said “now we can see why people think that NM is so pretty”. 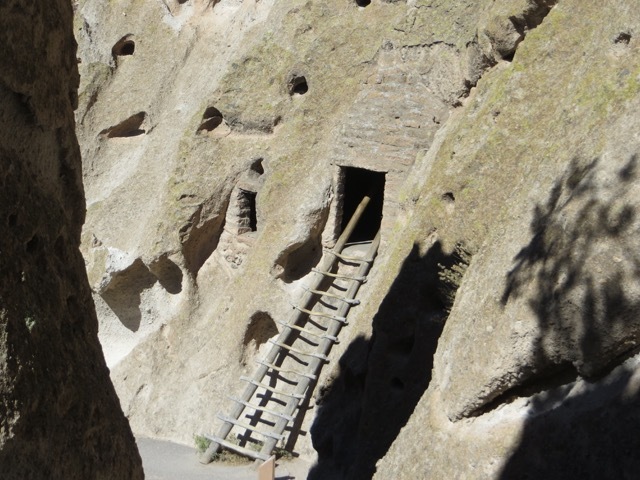 Bandelier National Monument is in a canyon, with cliff dwellings dating back to 1200. 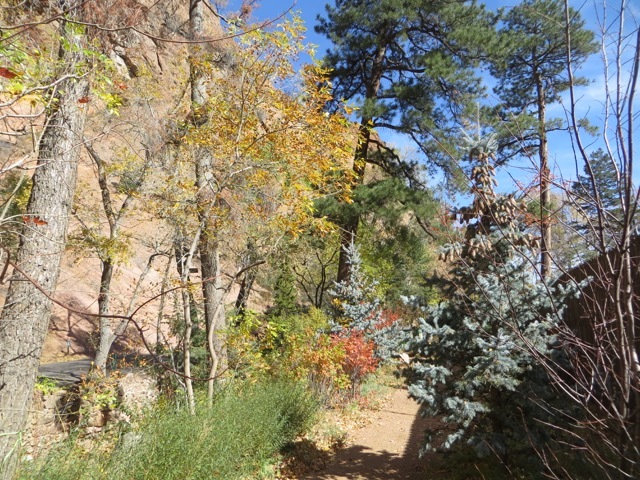 We strolled along a beautiful path up to the cliff dwellings. 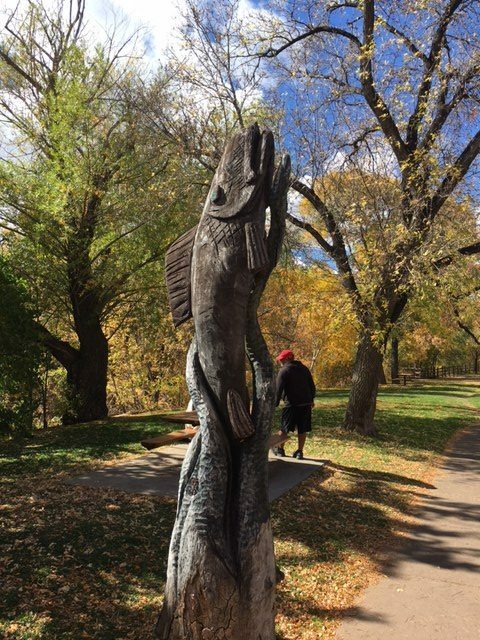 After Bandelier National Park we drove to Los Alamos which is one of the most interesting places and strangest places that we have visited in the United States. The recent history of Los Alamos National Laboratory was established in 1943 when the land there was purchased to develop the atomic bomb. 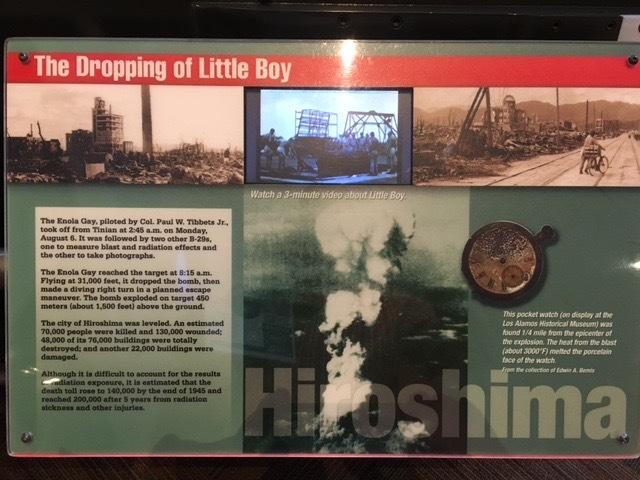 Scientist from all over the world were brought together to work in secret to develop the atomic bombs known as “Fat Man” and “Little Boy” that were dropped on Japan. As you enter Los Alamos you drive through guard gatess and the military guards at the gate tell say sternly “do not make any turns off of the main road and do not take any pictures”. Los Alamos was originally chosen for the Manhattan Project because of its remote location away from either coast where the scientist worked in complete screcery. 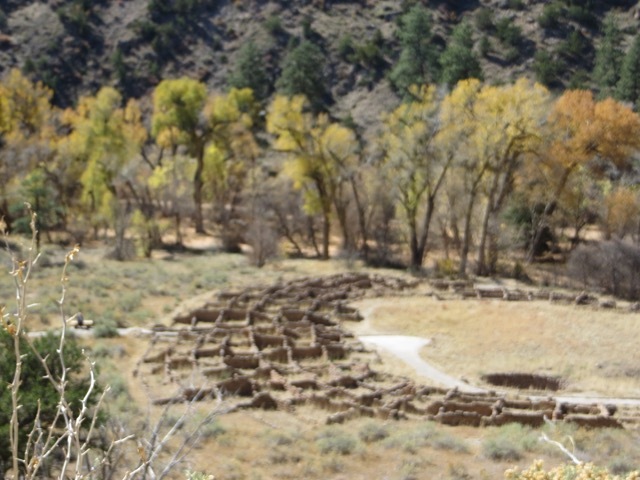 The land for Los Alamos was taken by the government, it was at the time a boys boarding school. 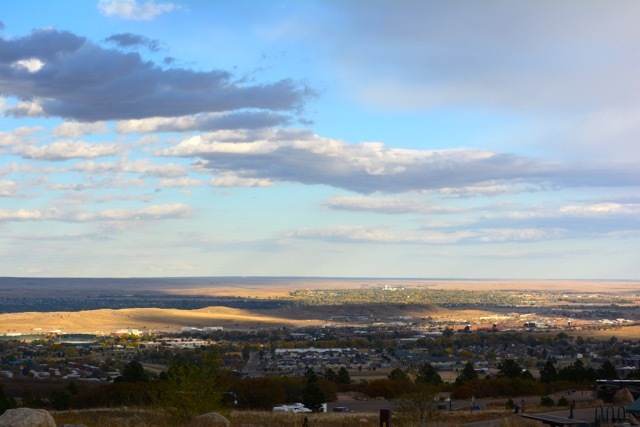 The name of the town was not even known; mail for scientist at Los Alamos was sent to a P.O. 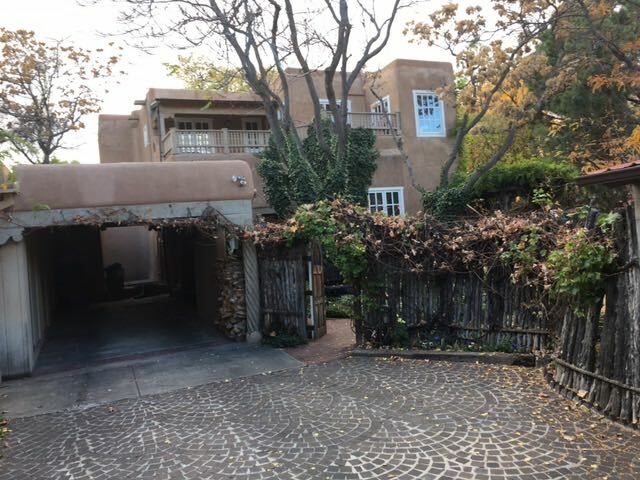 Box in Santa Fe where it was screened by one person and then driven by that person out to Los Alamos to be delivered. Even the scientist did not use their real names when they traveled outside of Los Alamos and the names on their driver’s licenses were only numbers. 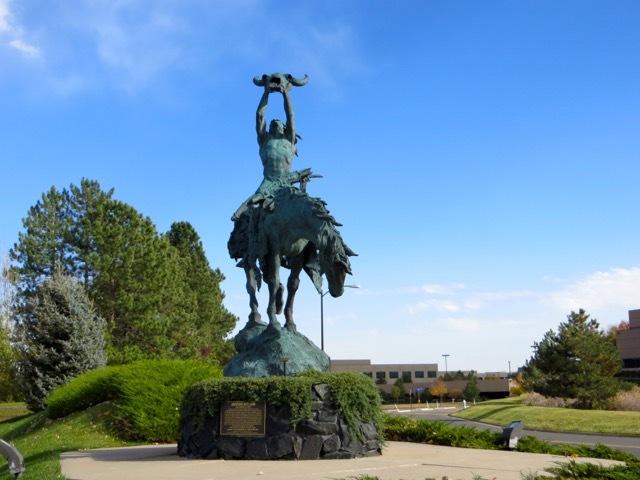 Today Los Alamos is one of the largest science and technology institutes in the world with a $2.2 billion yep that’s billion with a “B” dollar annual budget. 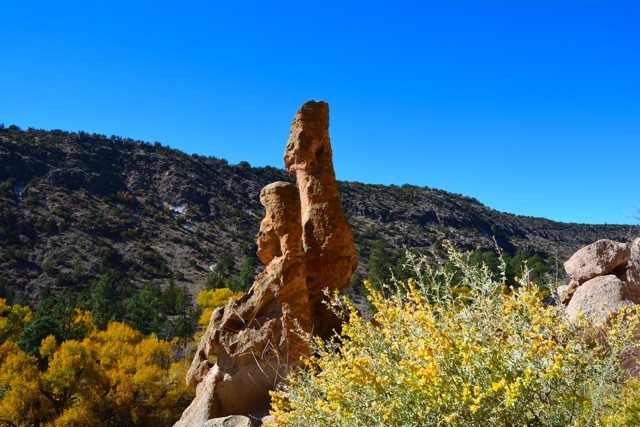 We have never been anywhere in the United States like Los Alamos. We are not sure what they are doing there today but it is still top secret whatever it is. Until 1958 no one living in Los Alamos could own property, the government owned everything; houses, stores, theaters. There was no poverty, no wealth, no crime, it was a “bubble”. In the town itself there is a semblance of normalsey but the feeling of “top secret” “crypto clearance” is everywhere. 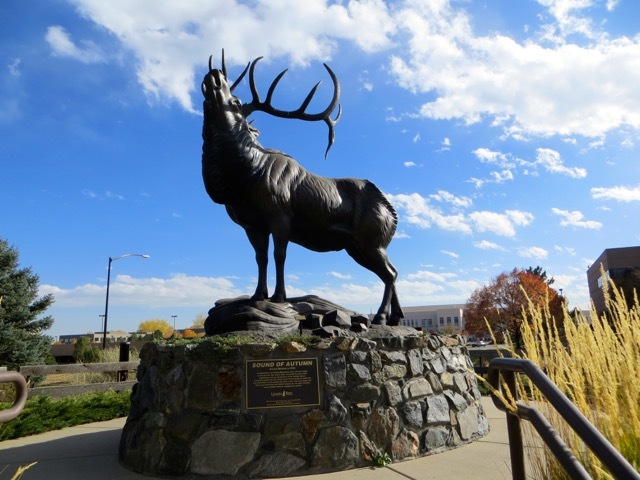 I asked the lady at the front desk of the museum if it would be OK for me to take a picture of the outside of the museum; she said “oh yes once you get into town it is fine to take pictures”. 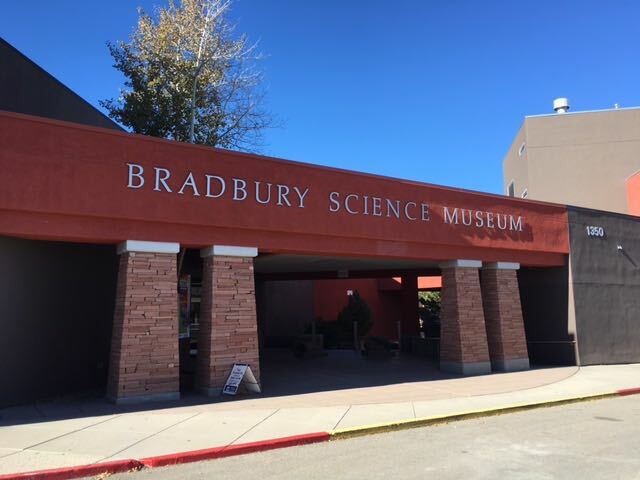 We visited the Bradbury Science Museum and saw a film that told the story of the Los Alamos and The Manhattan Project. We spent a leisurely day around the campground in the morning. In the afternoon we visited The Museum Of Indian Arts and Culture. We spent most of our time there looking at a exhibit called Oblique Views, it took original photographs of the south west taken by Charles and Anne Lindbergh in 1929 and placed them next to modern day pictures taken of the exact same sites by Adriel Heisey. It was interesting to see how few changes (with the exception of greenery) there were in the landscape between the two times. 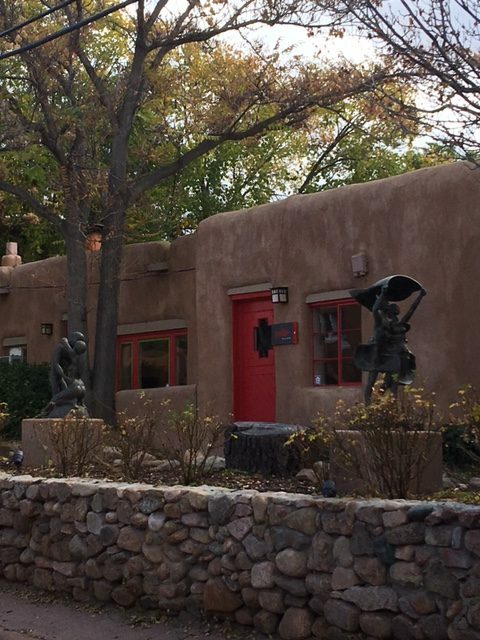 Was a drive day; we left Santa Fe at 8:00 headed South and then West. We planned to stay in Holbrook, AZ but we crossed into another time zone and gained an hour so when we got to Holbrook it was too early to stop. We decided to drive on to Flagstaff and ended the day parked at Twin Arrows, a Navajo Casino in the middle of nowhere, for the night. Casino’s welcome RV’s and they are safe; because the parking lots are patrolled because the patrons carry money. Staying in a Casino parking lot was a new experience for us; we had heard that they welcomed RV’er and that they are safe but we have never stayed in one and we did not know what to expect. The experience was a good one and given the opportunity we will do it again. The parking lots are level and Casino’s normally serve good food at reasonable prices. Twin Arrow Casino is on I 40 about twenty-five miles west of Flagstaff. It is rated Four Diamond by AAA; and yes it is a few steps up from a Walmart Parking lot. We counted twelve other RV’s in the parking lot. A nice new experience, and we only lost $4 in the penny slots! We got up, ate breakfast and leisurely drove to Prescott, AZ arriving in Prescott before noon. Lots of people retire to Prescott because the climate is moderate and there are about seven colleges nearby, Prescott was originally the state capital of AZ. We stayed at Point Of Rocks Campground, it was is nice as far as private campgrounds go, There was a beautiful hike to a nearby lake that Eddie took at about dusk after spending the day in Prescott. Prescott is only about an hour and half from Phoenix but because the elevation is five thousand feet so the weather is much cooler than Phoenix. 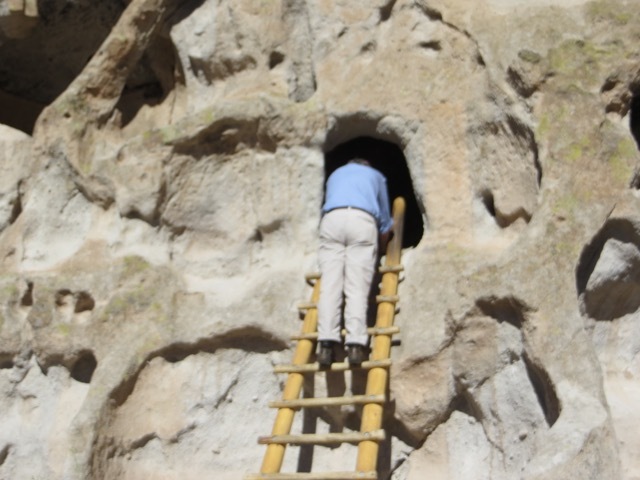 Lots of Phoenixican’s have second homes in Prescott and it has become a retirement community. The four people in the picture below in front of the saloon are all “come here’s” and they should work for the Prescott Chamber of Commerce. 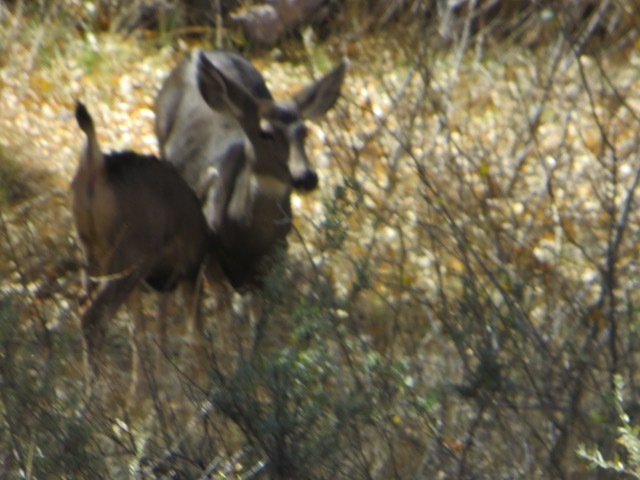 They moved to Prescott to retire and love the area. 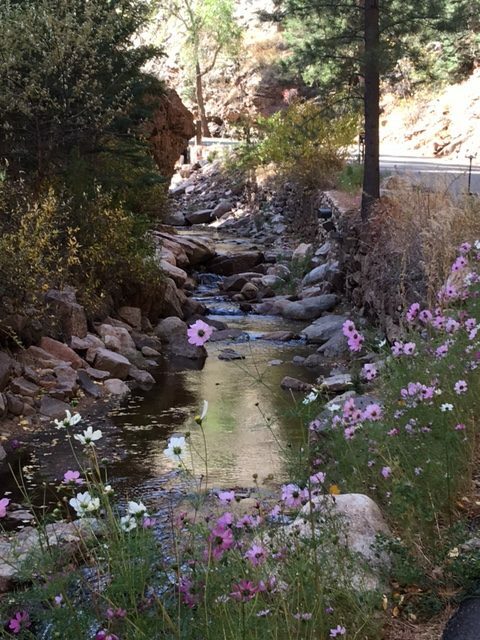 We have been to Prescott before and like it but we would not trade it for Phoenix/Scottsdale. 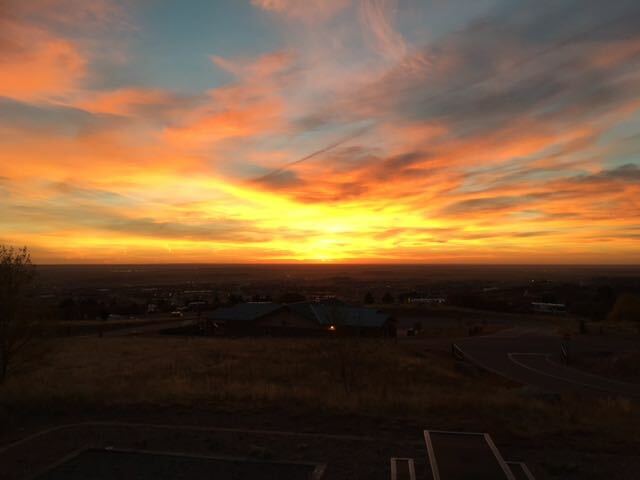 We planned on staying in Prescott for three days but when we woke up Sunday morning we looked at one another and said “let’s go to Scottsdale”. So, we hooked up, CEE MORE drove into Scottsdale ending a three week adventure. 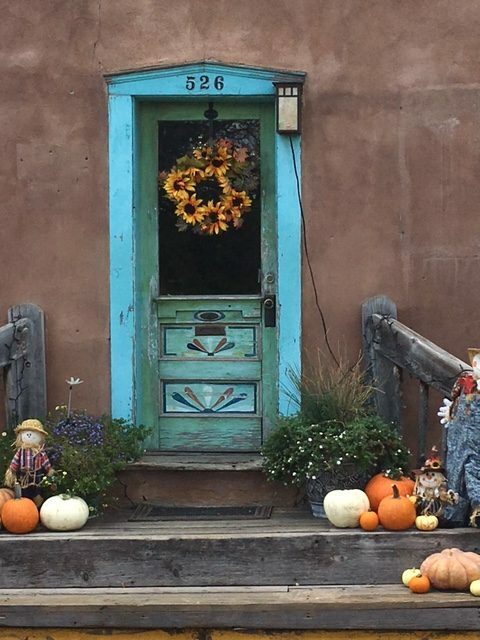 We had a wonderful trip with great weather the whole time and fell in love again with Colorado. 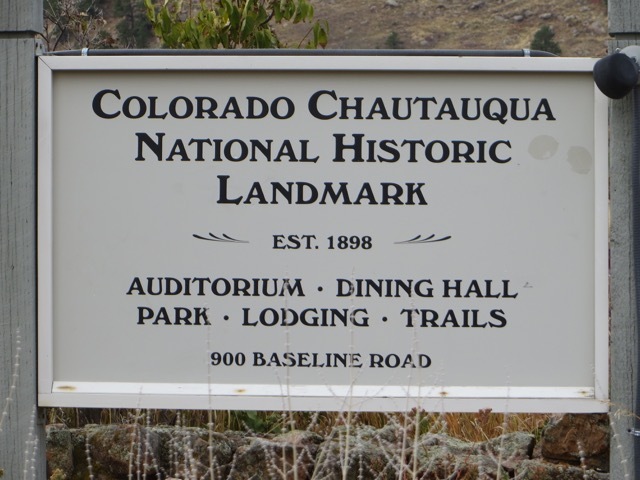 We were in Colorado on 9/11 in Black Canyon of The Gunnison National Park and moved to Telluride. 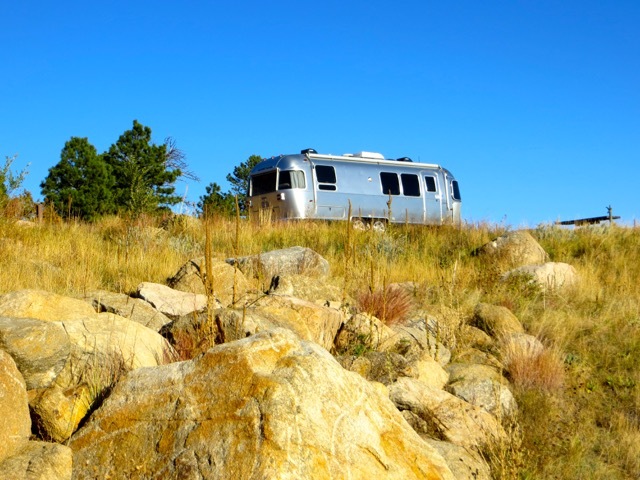 America has so many beautiful places and so many nice people we continue to love life on the road in our Tin Can! Marti, glad that you enjoyed the pictures! 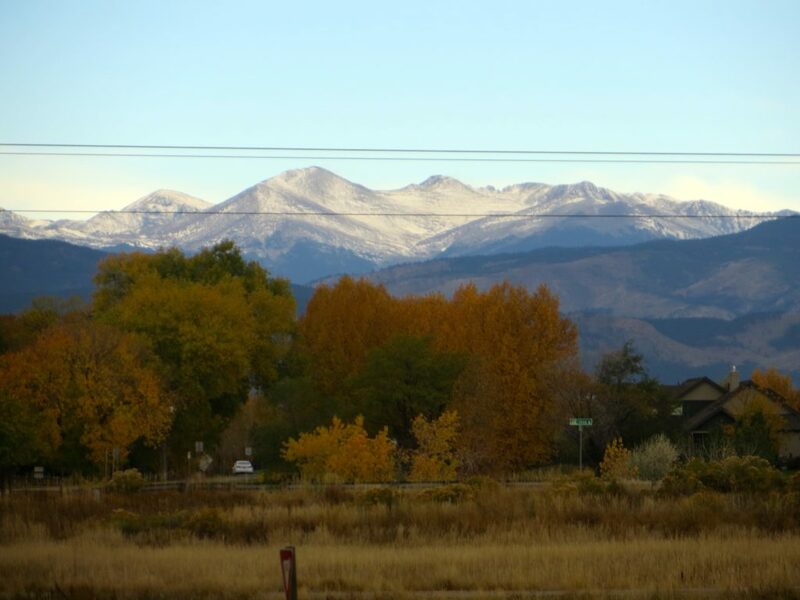 Cville is a great place to live but Colorado is special too. Thanks for the great ideas, they were greatly appreciated! Bob, glad that you enjoyed the blog! I always enjoy following you and Gayle on your hiking excursions as well. 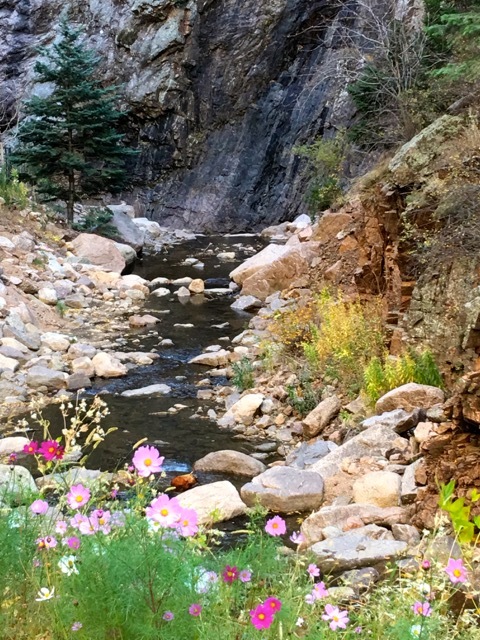 Colorado is a special place I could stay there of six months. 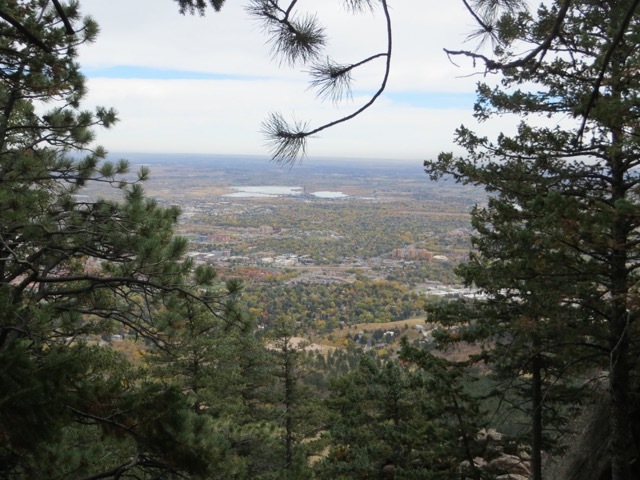 I loved Boulder and Colorado Springs! 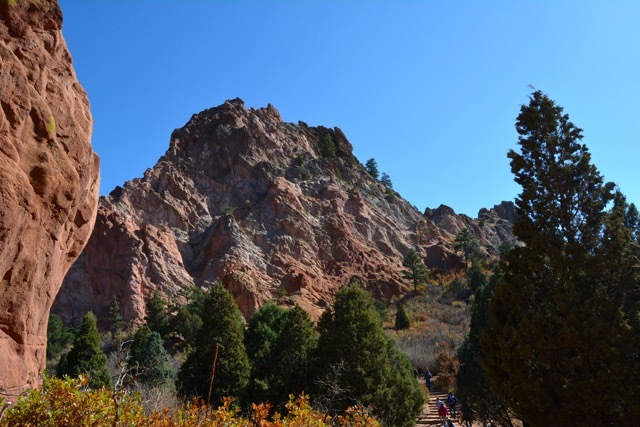 I can’t wait to get to Cheyenne Mountain State Park!! Greg, the west has far more places to camp. 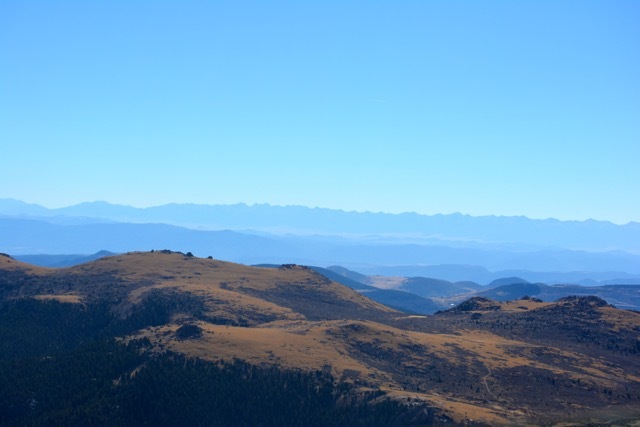 I especially think that you and Martha would enjoy it because there is so much BLM land. Ed and Roberta, this is an amazing account of your travels and I’m almost of a mind to hook up again! Loved every bit of it. Thanks for sharing. Bevin, I am glad that you enjoyed our blog. 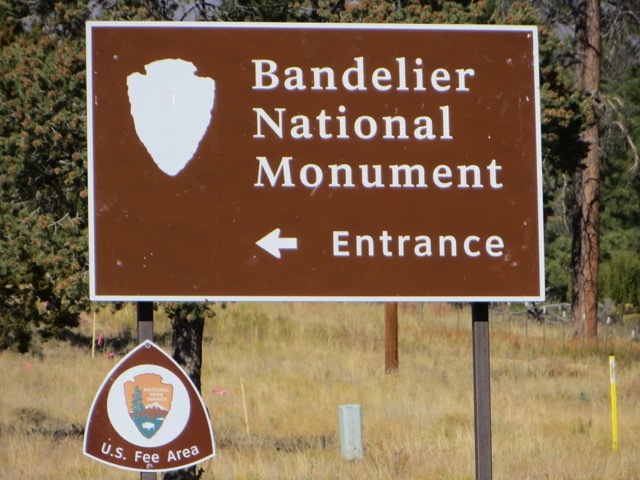 We love traveling in the AS and we are fortunate that America has so many beautiful places to see and so many nice National and State Parks! Great pics. Having worked in CA,DC,MD,WA,FL,NY,PA,NC,SC,GA,TX,HI,AK,NJ,MD,MA,ME, as well as Japan, Puerto Rico, Okinawa and the Philippines, I regret that I didn’t have time to explore the surroundings to take in more of the culture. Looks like you guys are truly “Livin’ the Dream”. Congrats and looking forward to getting together with you guys. Thanks Fully, you have done so much internationally, we are international “bumpkins”. Look forward to getting together with you and Corine it’s been too long!